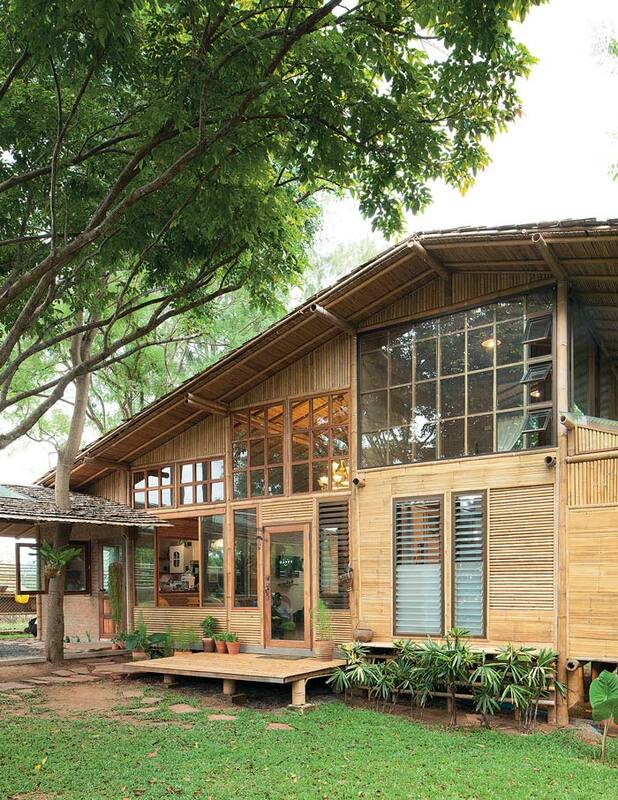 Building a sustainable home involves a great deal of knowledge of the surroundings and their relationships with nature. 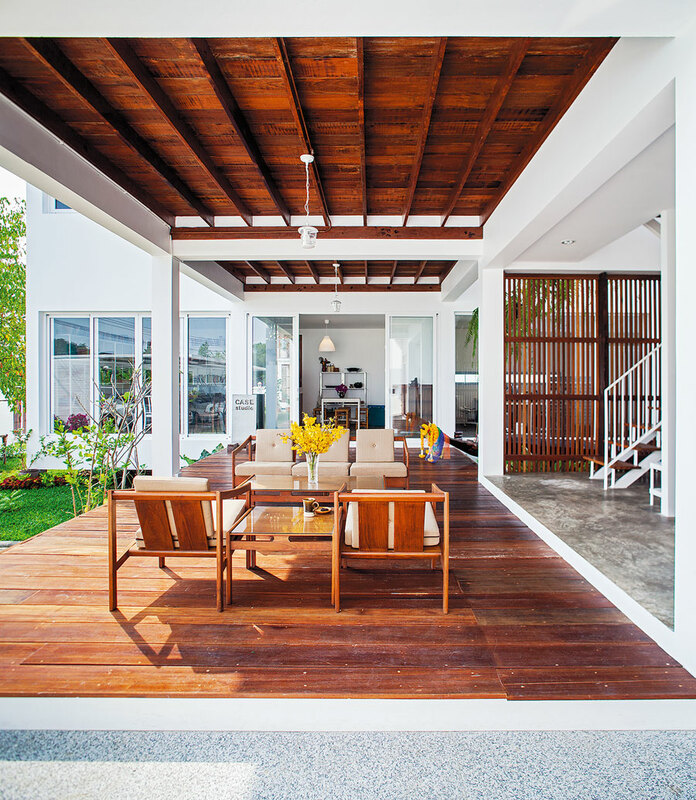 In the hot and humid climate of Thailand, it’s useful to have a good grasp of the sun, the wind, and seasonal thundershowers in designing a home that’s livable and aesthetically pleasing. 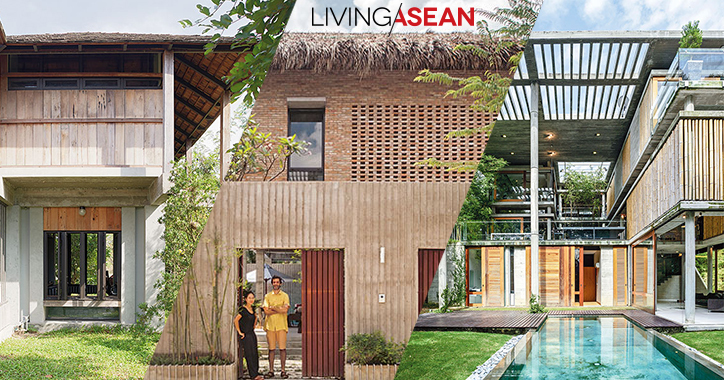 This house is built around that concept – one that promotes well-being and the comfort of the indoor environment. The architect uses a folding process common in metalworking to translate multiple planes into three-dimensional interior living spaces. 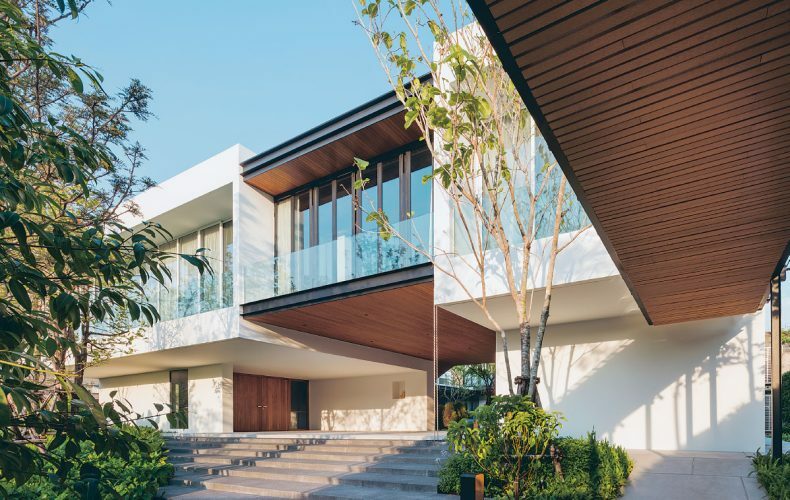 Vertical surfaces are later installed and wall openings added to enable the home to effectively connect to its natural surroundings. That being said, architect Nantapon Junngurn took the most sensible course of action. 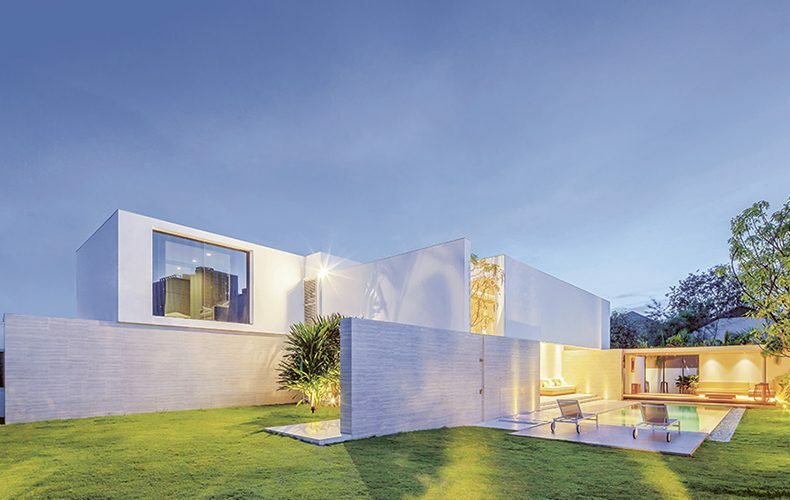 He positioned the home plan in relation to seasonal variations. In a few words, all aspects of the sun, the wind, and weather patterns were taken into account. He then put the idea to the test to determine what architectural form and space would best fit in with the environment. In so doing, a folding process common in metalworking was used to translate two- dimensional data into 3D modeling. 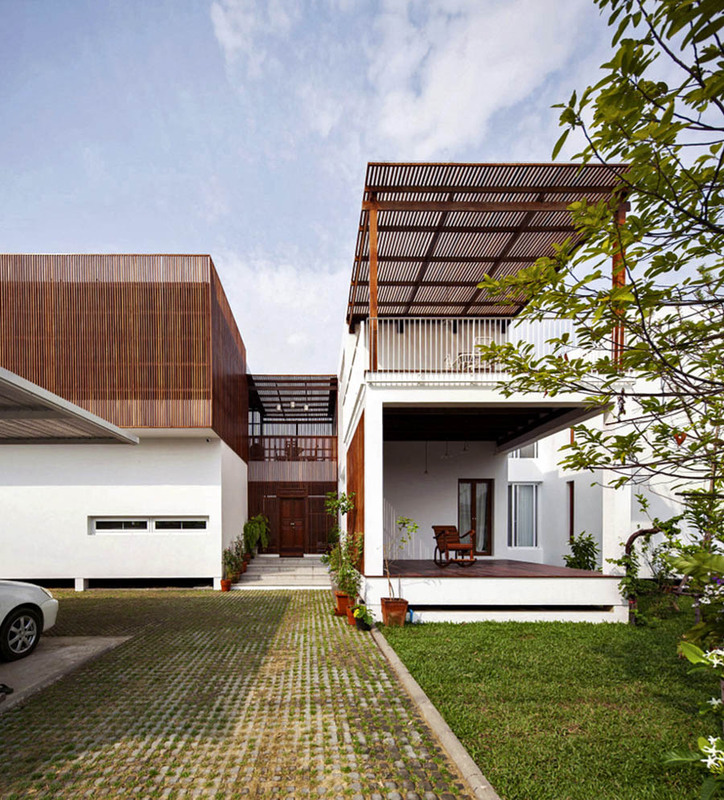 The result was a comfortable home that was oriented around a central courtyard. 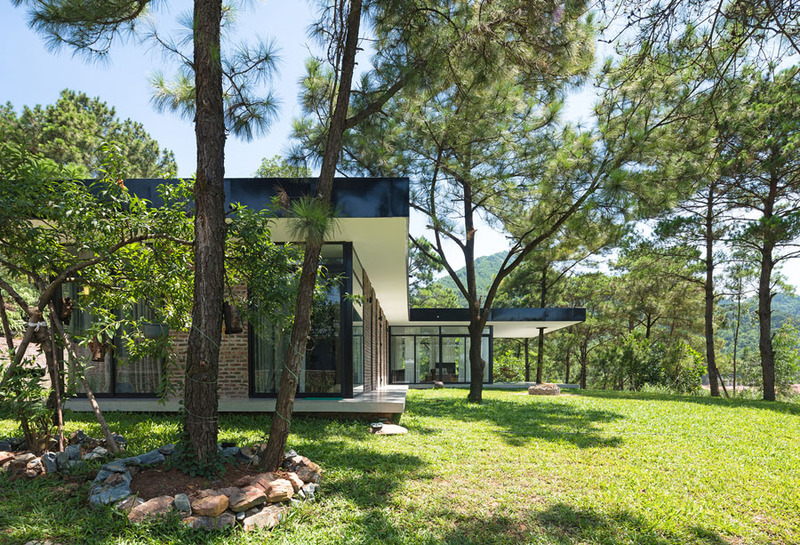 To bring the outdoors in, large openings in the exterior walls were included in the plan in a bid to retain the connection to the home’s natural surroundings. 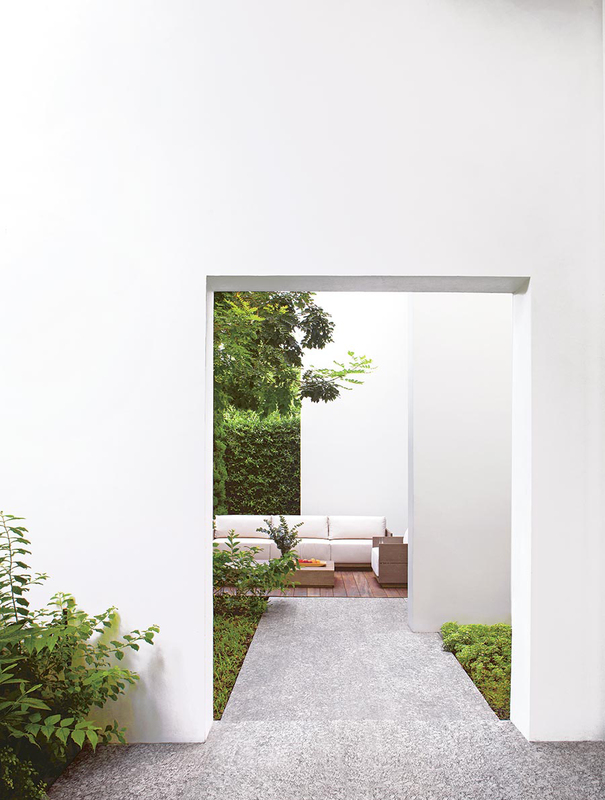 The further end of a sitting area is built of concrete that runs the entire length of the wall. An increase in floor space is achieved by simply doing away with support poles. Bottom line. 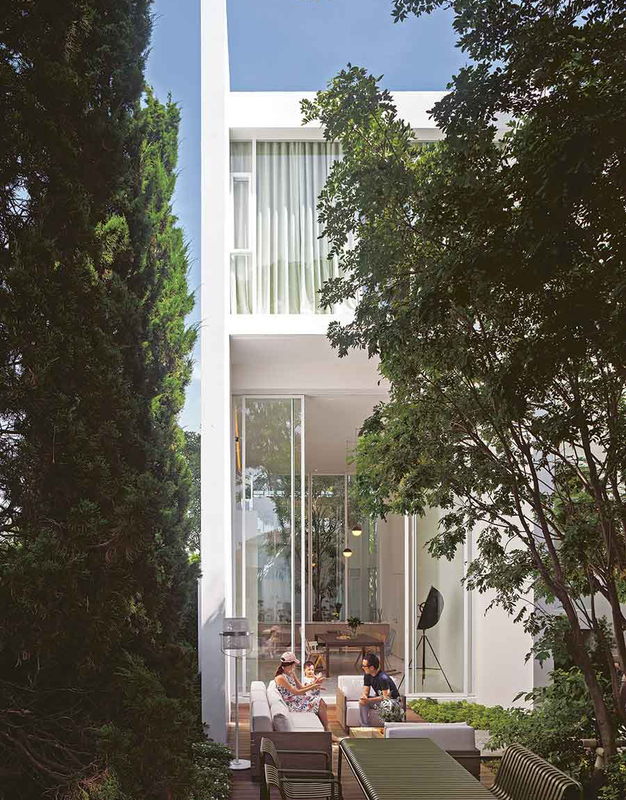 Nothing comes between the lush garden view and the interior living spaces. 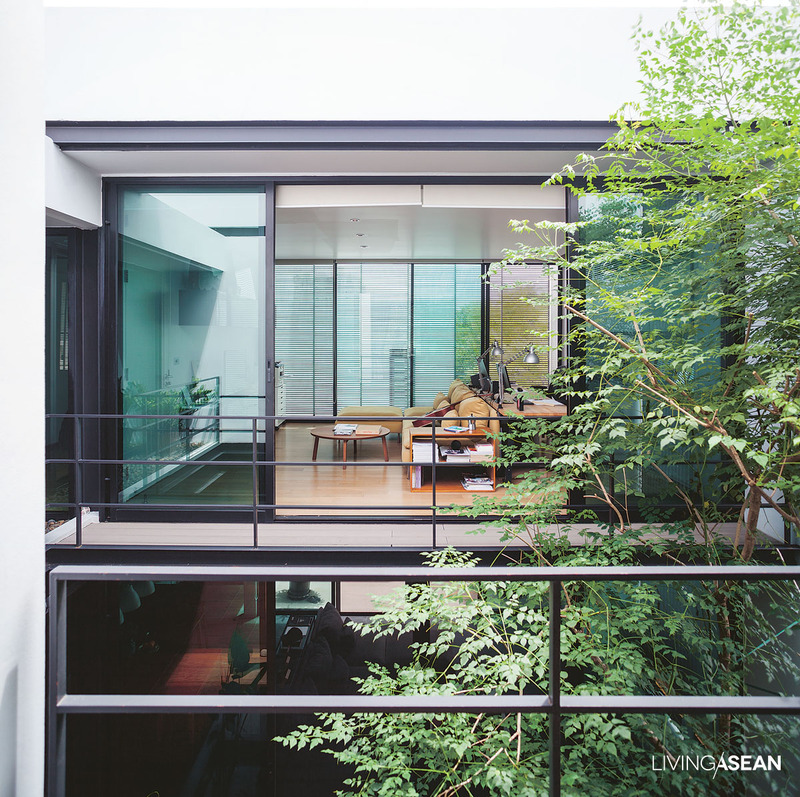 The U-shaped floor plan had a small body of low ground that transformed into an inner courtyard filled with greenery. There is an Indian oak, or freshwater mangrove tree (Barringtonia acutangula) that is now in top form providing a continuous layer of beautiful foliage. Nearby a Spanish cherry, or bullet wood tree (Mimusops elengi Linn) grows into a full crown. It came as a house-warming present from dad. 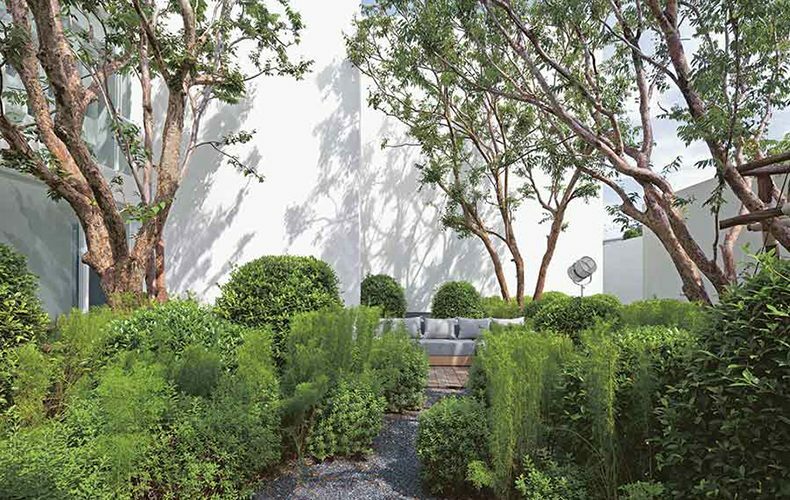 At the center, a small pond adds a touch of nature to the courtyard garden. It’s the natural focal point that connects to practically every part of the house. It seems the house plan best suited for the hot and humid climate is one that’s light and well ventilated. 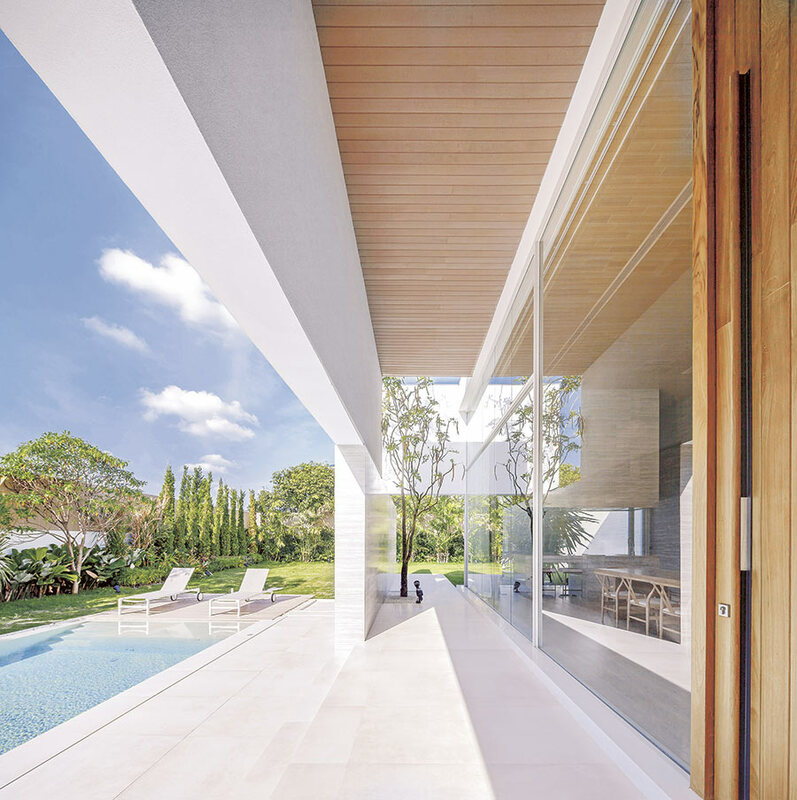 Thermal comfort can be achieved by shielding the area exposed to danger of too much sun. In the meantime, open up the part that connects to the natural surroundings. In essence, it’s about interacting with nature. When the home breathes easily, its occupants feel relaxed and comfortable to live in it, without a doubt. The entrance hall contains a living room, dining room and a library on the mezzanine. 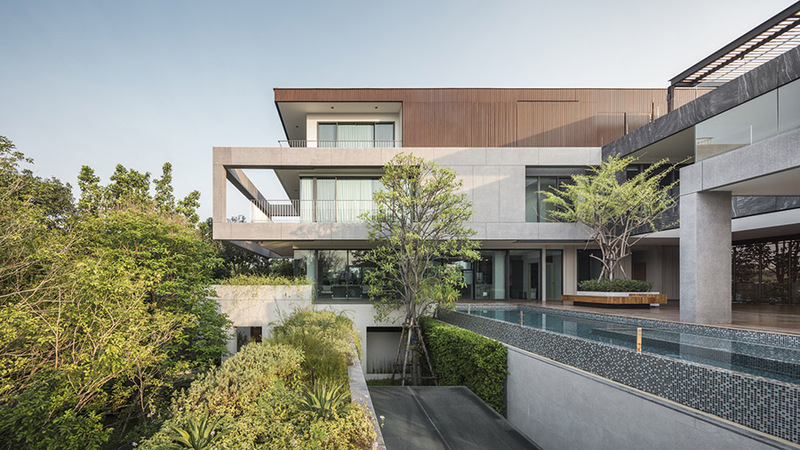 It is bordered by glass walls on two fronts–one side opens to the front yard, the other connects to the inner courtyard which serves as engine that drives air circulation. 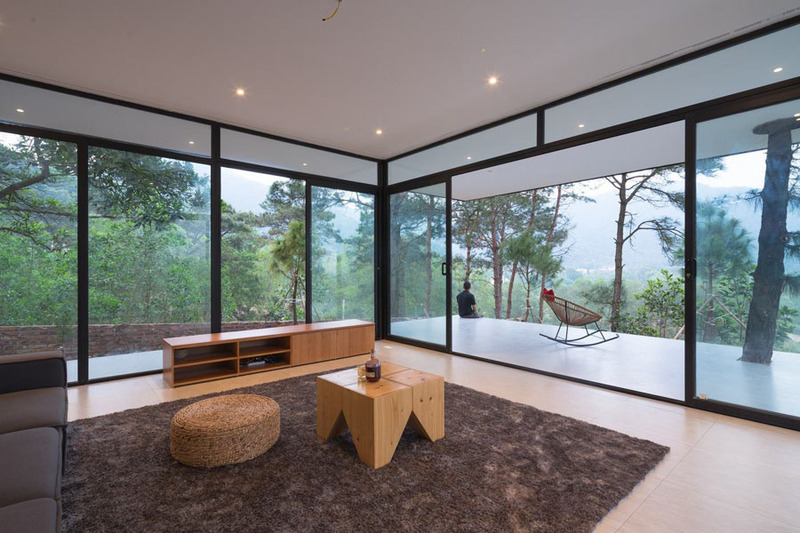 Large opening glass walls on two sides are there for a reason-bring the outdoors in. 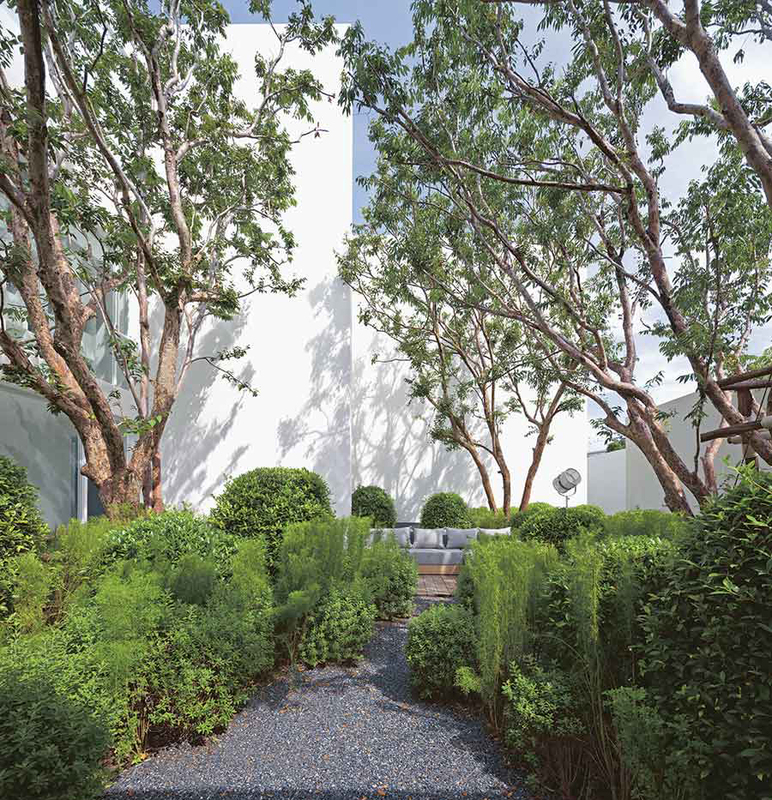 The courtyard that’s pleasing to the eye makes it feel like being surrounded by nature. The living room and dining room appear light, bright and airy, thanks to the floor-to-ceiling glass walls overlooking the central courtyard. 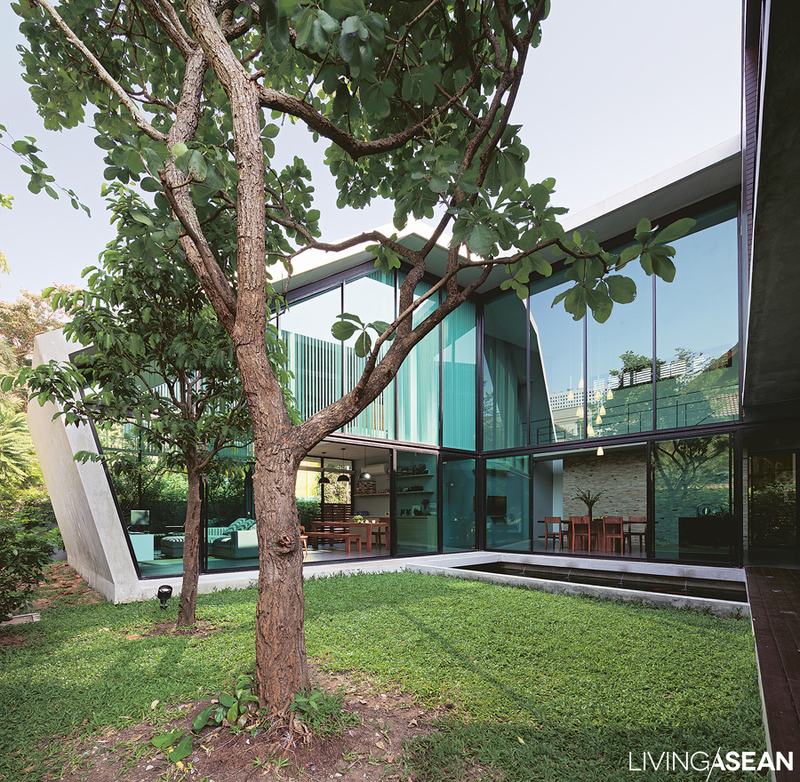 A lush, green garden under the open sky can be seen in full view from inside the home. Located at the center of U-shaped design, the dining room takes in the view of the courtyard garden and a seating area in the foreground. 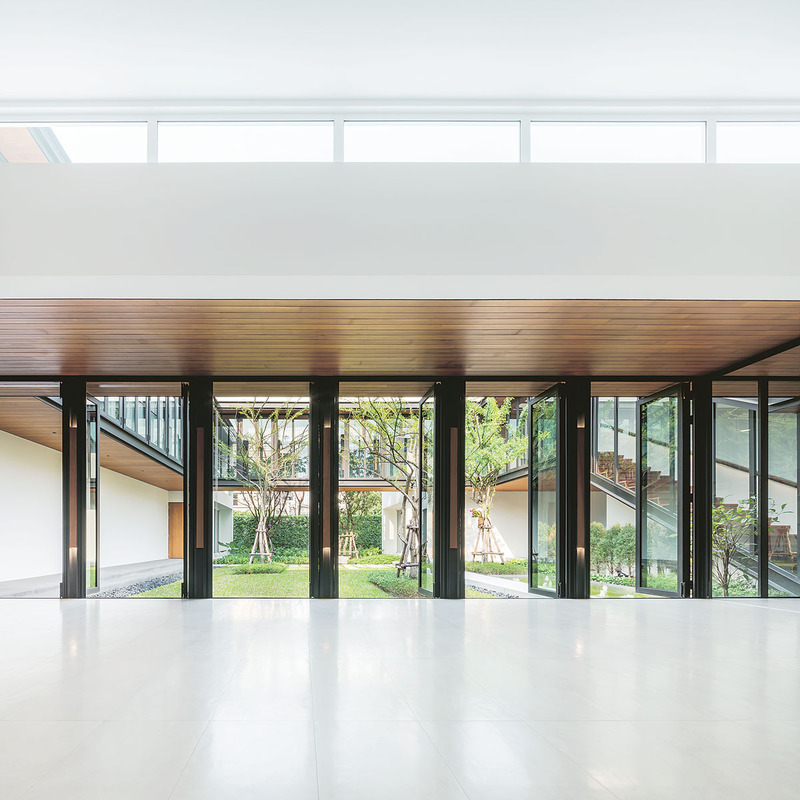 Full glass walls lighten up the entrance hall and promotes natural air circulation in the building. 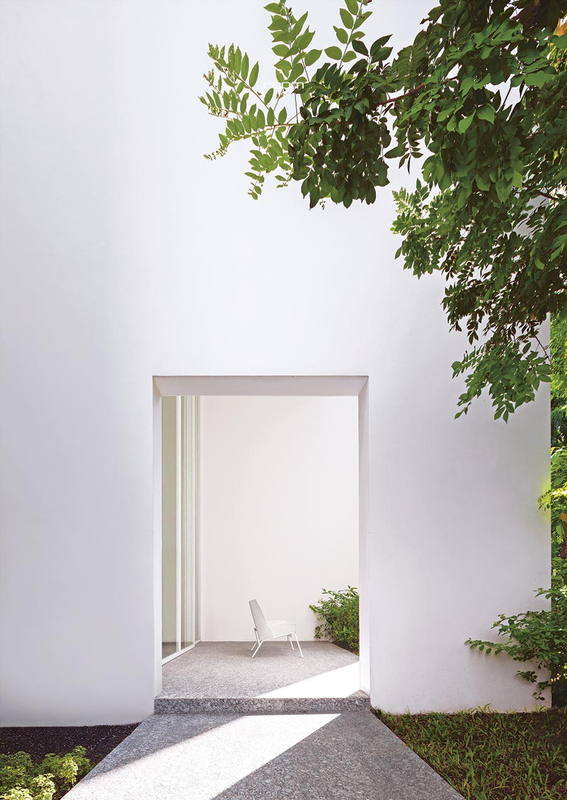 They provide visual continuity that makes the idyllic inner courtyard very much a part of the interior space. 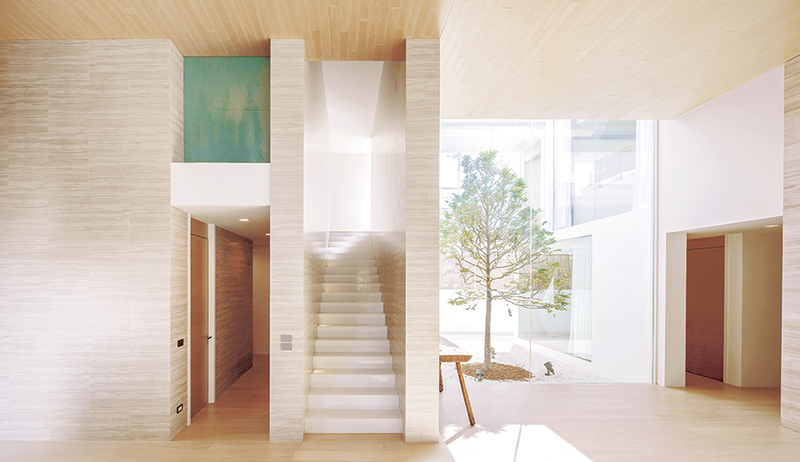 A run of stairs leading to the upper floor is cantilevered out from the wall. With one end anchored securely in the stone wall, the steel treads appear to hover in midair. Each plate is 20 millimeters thick. 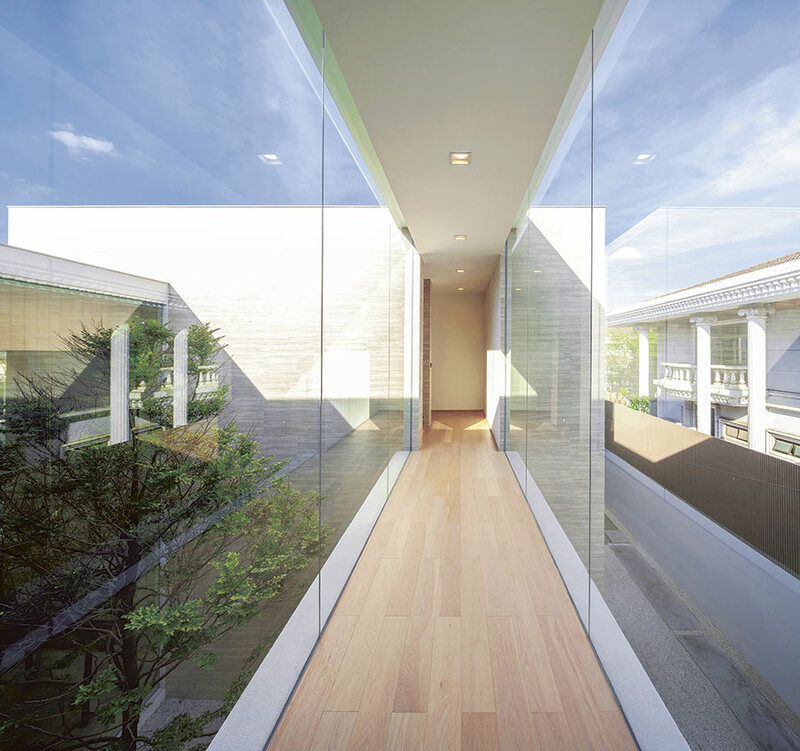 Large opening glass walls guarantee the garden view landscape is visible from here. An Indian oak, or freshwater mangrove tree (Barringtonia acutangula) develops well to keep the inner courtyard in shade for much of the day. Its lush green crown adds rejuvenating effects to the garden landscape. Because the house was left unoccupied for about ten years, naturally there were parts that had fallen into disrepair. Remaining intact were the ho-hum room dividers typical of housing developments that were built some time ago. The homeowners returned after a brief hiatus only to find it was conveniently located in the area of the school where they planned on sending their children. That was a big plus in terms of a good quality of life. 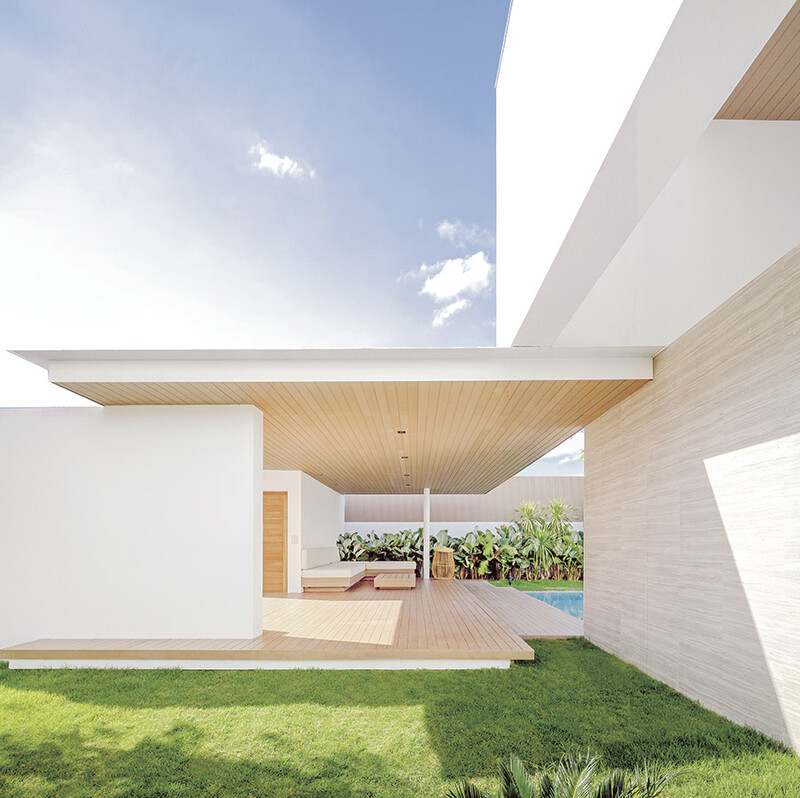 The courtyard consists of a garden and a swimming pool that lies at the further end to protect the privacy of the family living here. Invisible from the street, it offers a pleasant outdoor space that connects the whole house with its natural surroundings. 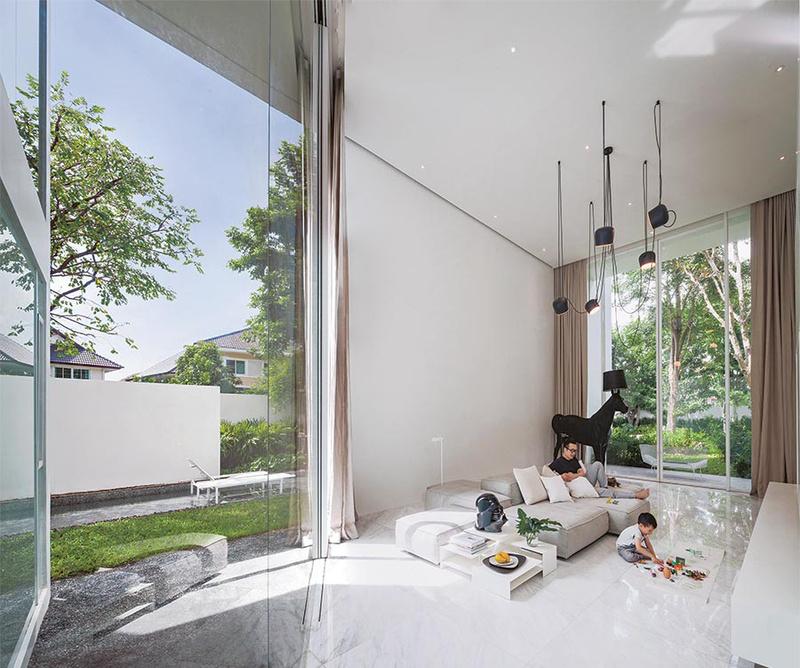 Double-height glass walls make the playroom for kids bright and airy. It’s a TV room and toy room in one. Bean bag furniture in lively colors fits in well with the fun atmosphere of the interior room and the adjoining outdoor playground. 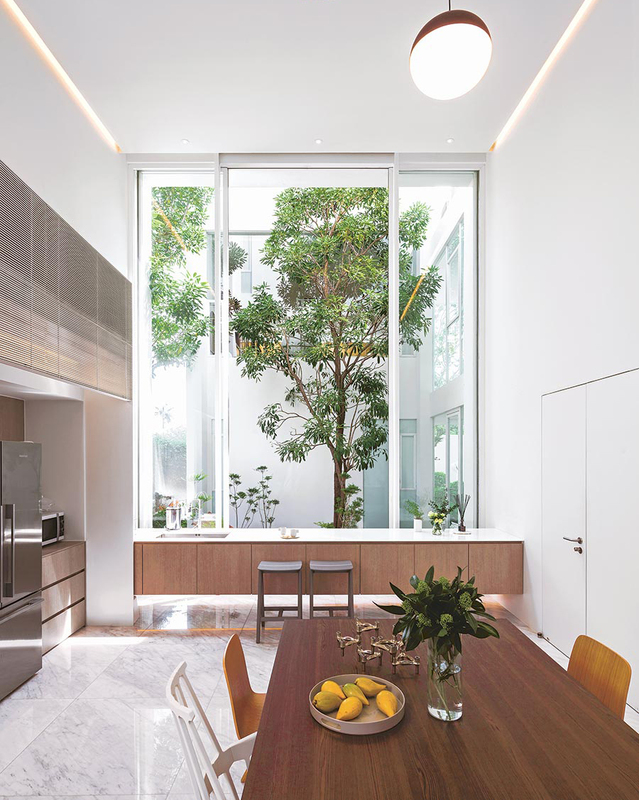 The dining room is bordered by bi-fold glass panels that stack flush against one another as they open to connect with the garden outside. 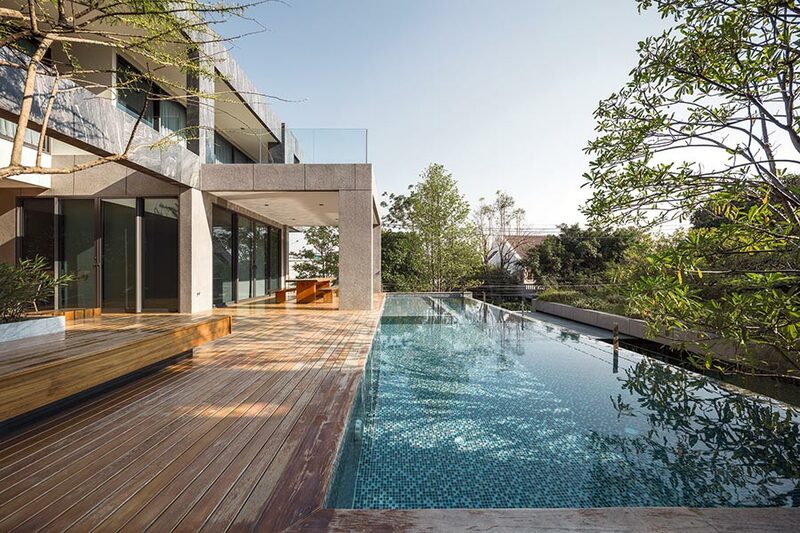 The lush courtyard can be seen in full view from inside the room, while a well-placed swimming pool provides passive cooling that reduces internal and external heat gains and brings in fresh air. Design-savvy ideas result in thermal comfort that transforms the dining area into a family connecting room. 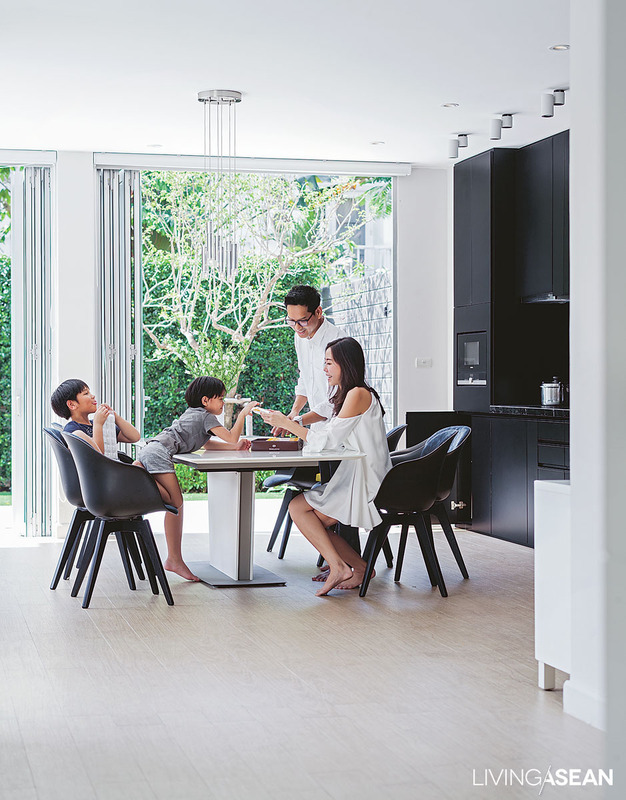 The Life of Gravity concept gets its inspiration from an open space that attracts everyone in the family toward the center of the home, especially the dining area overlooking the courtyard. 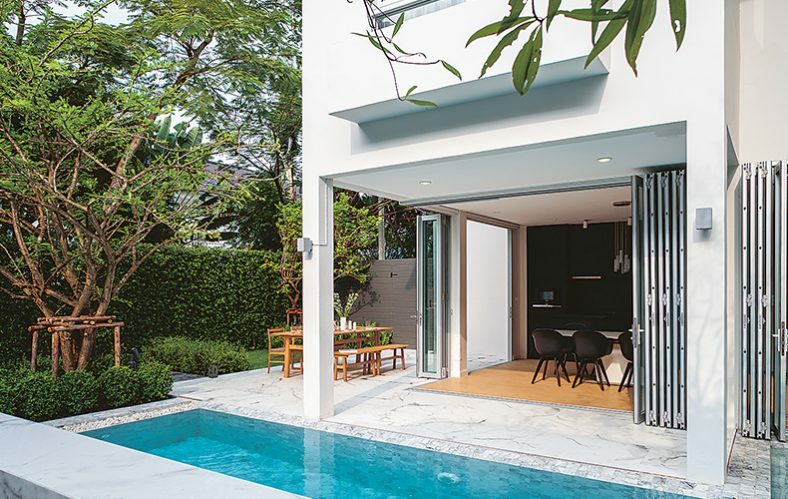 The room is complete with an array of folding doors that open to connect with the garden, the swimming pool, and other outdoor facilities. There’s something for everyone, and that’s what makes people gravitate to an interconnected lifestyle. For the children, it’s the playroom that has become their favorite hangout. For mom and dad, the dining area has been an oasis of relaxation. They can rest by the pool, or go for a quiet saunter around the yard. Regardless of where, the family will never be out of sight of one another. Subtle, soft shades of colors that speak to the minimalist style keep the sitting parlor calm and spacious like the homeowners intended. A level platform along the outside of the building is ready for an alfresco dinner when the weather is nice. 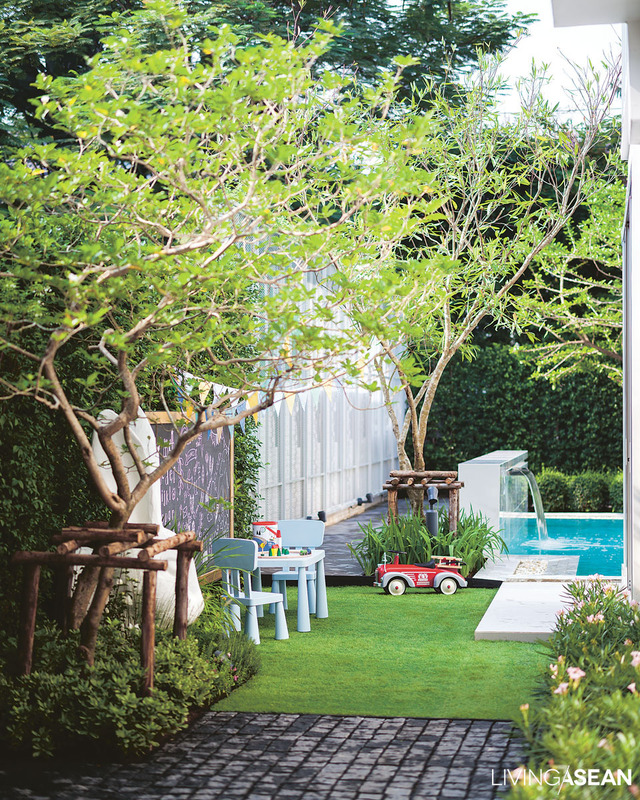 A rabbit head sculpture adds interest to an outdoor playroom by the pool, while a lush green lawn makes it a nice place for kids to run around. Seen from across the swimming pool, the recently remodeled home is a welcome place that makes the family feel safe and warm. The family’s firstborn son is married and household members have increased. 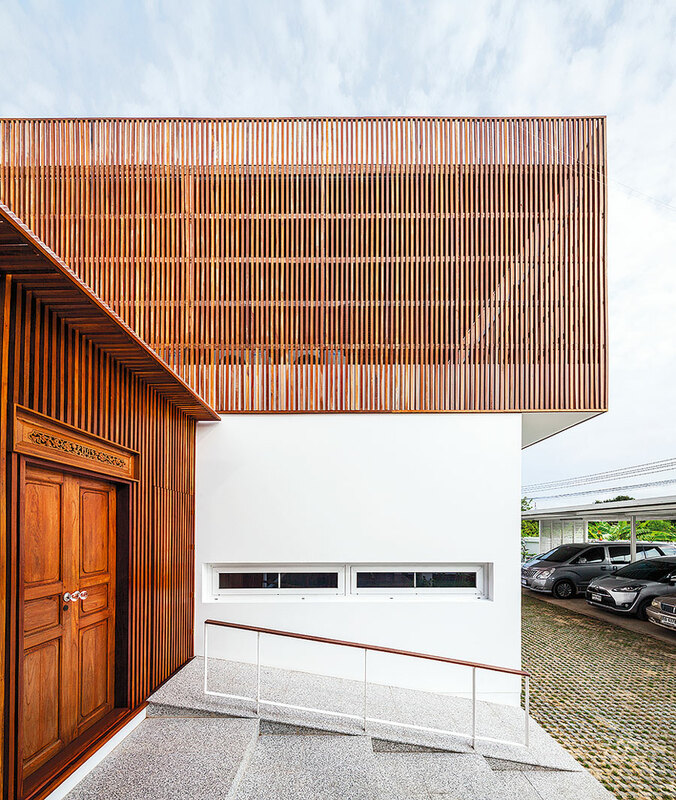 For the past 40 years, the old house located on a residential estate has gone through various stages of repair and expansion. 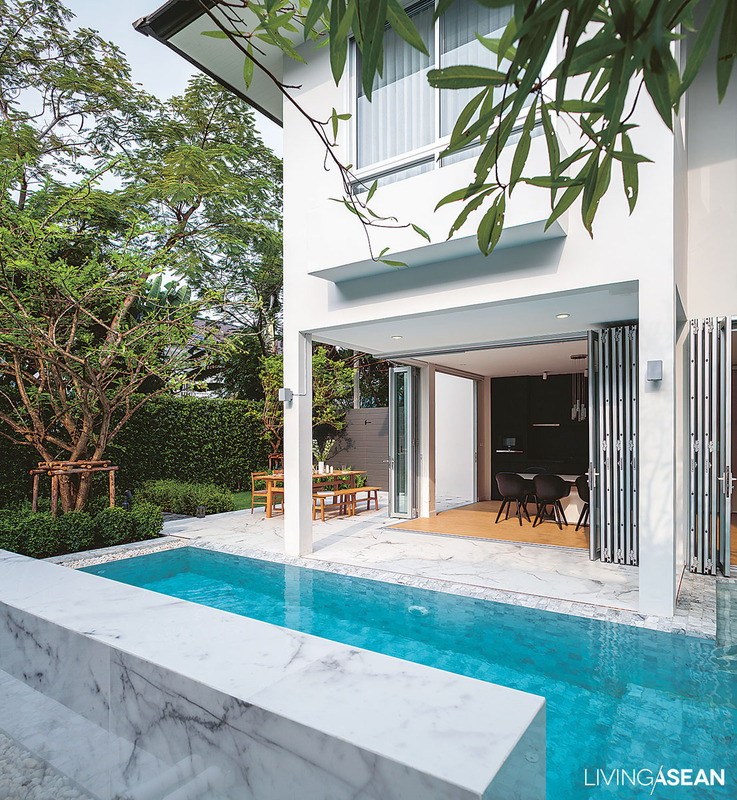 The time for further improvements has come, and the Sattayavinij family thought it wise to renovate the dated, tired- looking home, turning it into one that’s warm, livable, and in sync with the present time. 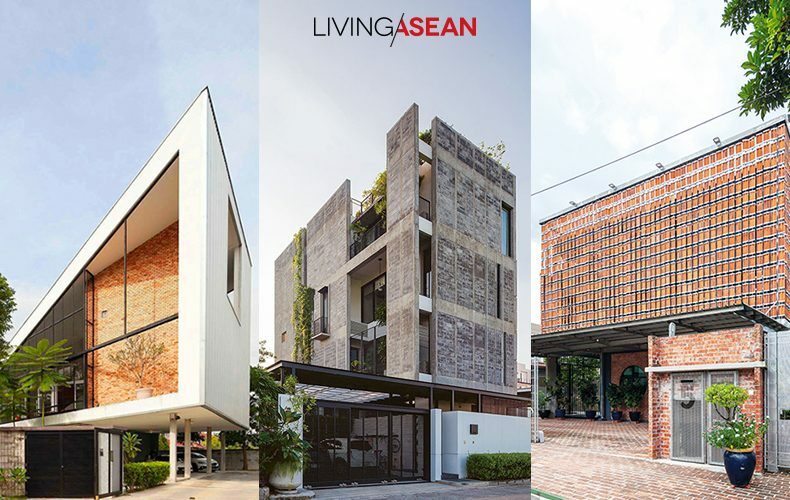 Woranol Sattayavinij, the firstborn, is an architect at the reputable company Architects 49 Limited. And the responsibility to remake the home rested with him. Earlier on, the family had entertained the idea of tearing down the old house to make room for a new one set on 96 square wah of land. 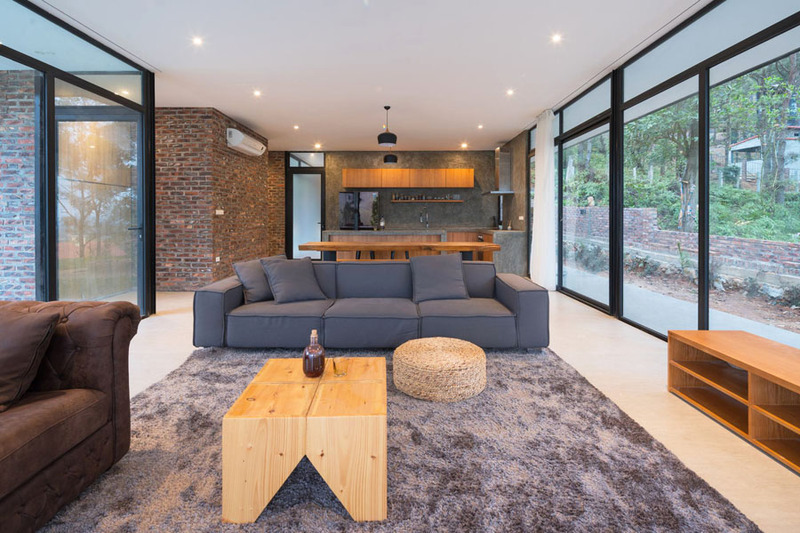 Fully aware of the family’s lifestyle needs, the kind of place they wanted, and the limited budget they had, he had a change of mind and went for a renovation project instead. 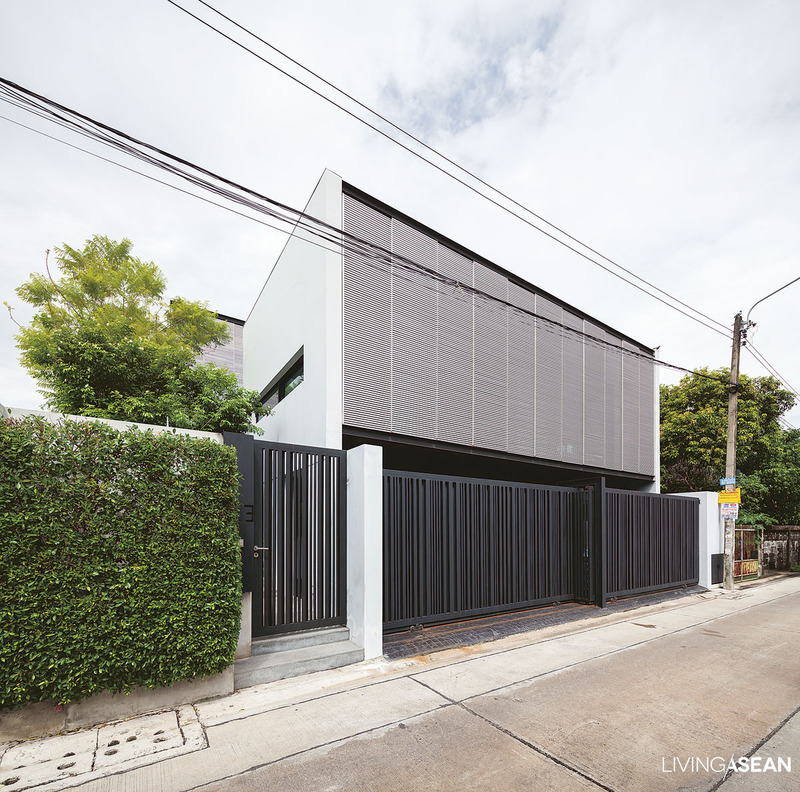 Tall aluminum latticework that makes the front façade protects the west-facing home from harsh sunlight. It provides a buffer against solar heat gain building up in the interior. 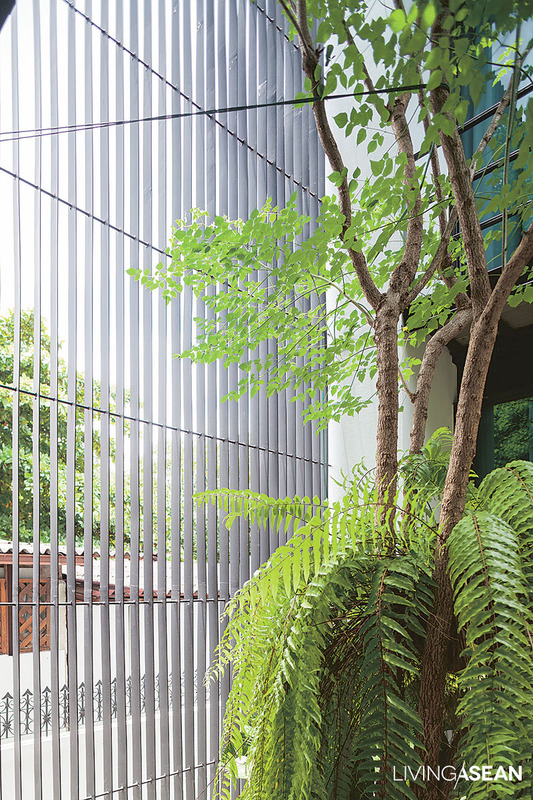 On the street, black iron lattice fencing promotes natural air circulation and doubles as a privacy screen. “The question is: How can I go about it in coming up with design that’s open, bright and well ventilated? First, the land itself isn’t oriented in a direction that can avoid getting direct sunlight or minimize solar heat gain. Besides, it’s a modest home. There isn’t much room for the long roof overhangs needed to protect it from the elements. 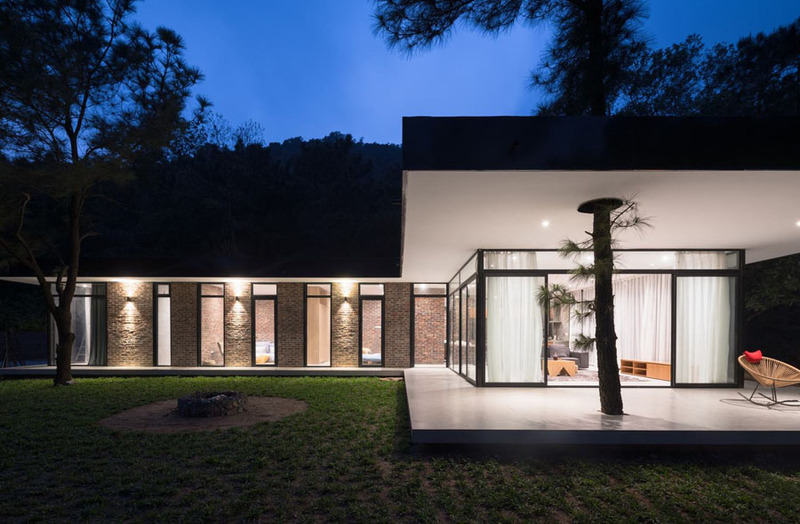 So I solve the problem by putting a courtyard at the center of the home plan to make the interior light, airy and very comfortable,” said the architect. That said, Woranol chose box-shaped design featuring twin rectangular buildings that run parallel to each other with a courtyard in between. 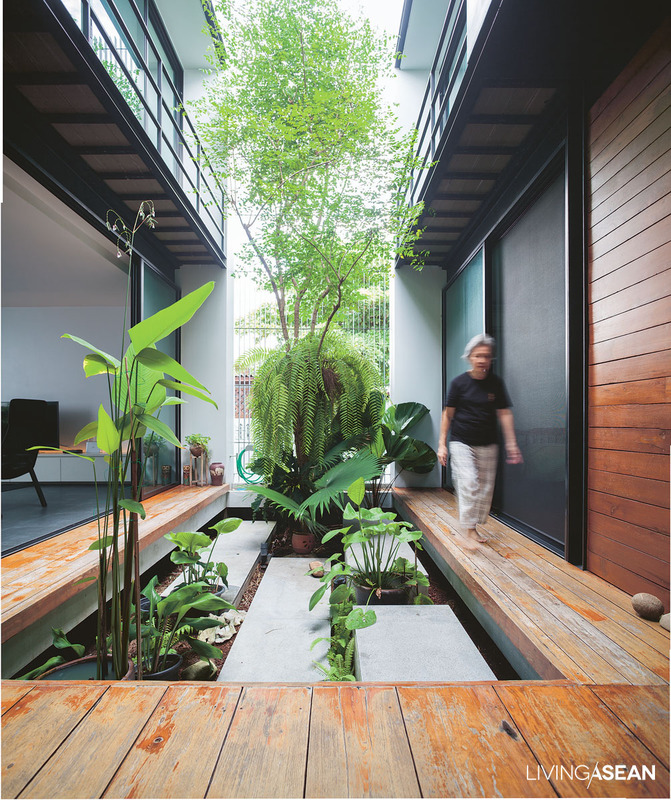 The little oasis that’s open to the sky contains a small garden with a wood deck made for sitting and catching some fresh air. It serves as engine that drives natural air circulation all day. This creates a comfortable atmosphere in the entrance hall. As for the A/C, who needs it anyway? The forward part of the house has a carport that’s separated from the street by wrought iron fencing. The black on the fence contrasts with the silver on aluminum latticework protecting the building. From the outside looking in, it’s clear that privacy protection is high on the list of priorities. 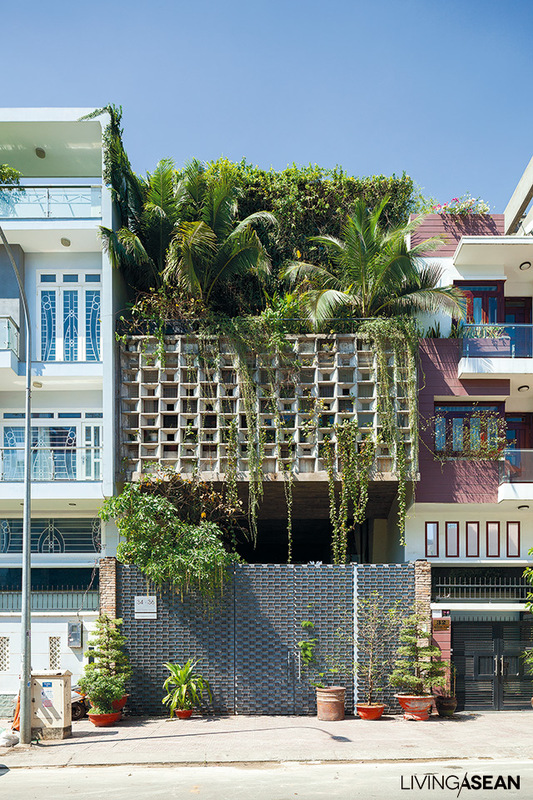 It’s achievable without sacrificing the desire to live in close touch with nature. A flight of garden steps leading to the house interior is canopied by overhanging trees thriving along the fence line. 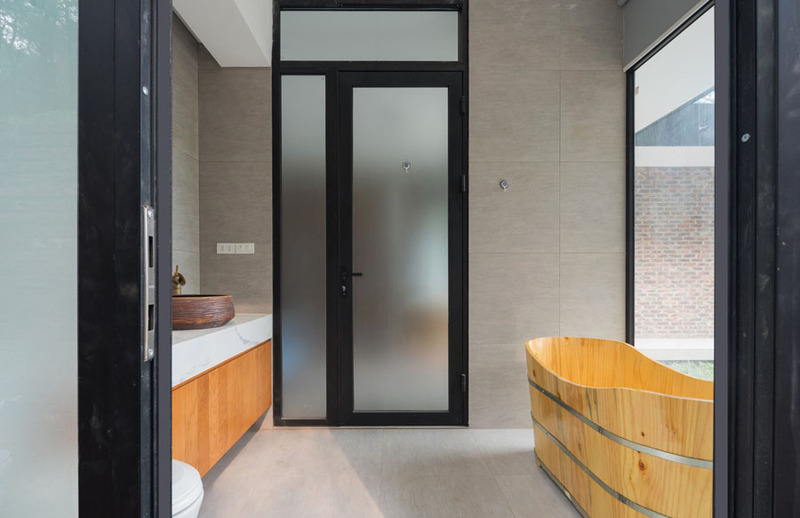 The corridor offers enough room to stroll around in the privacy of home. The unroofed area between the buildings becomes a small courtyard garden. At the further end, the architect puts in a long seat for people to relax under the shade. 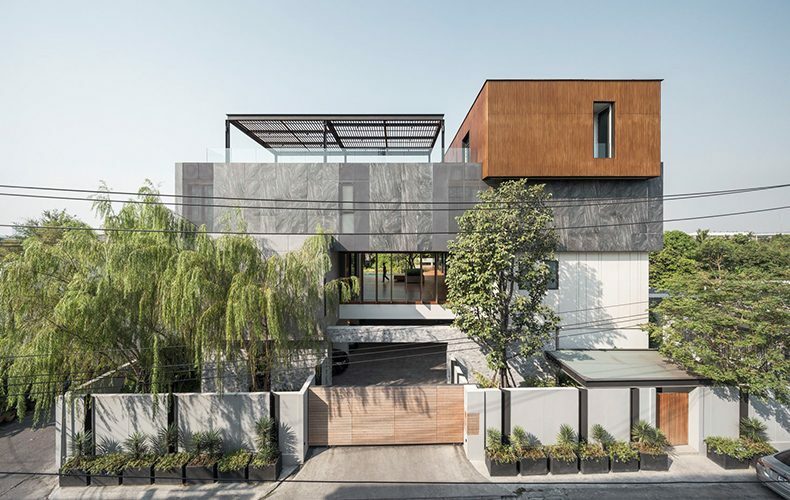 Evergreen Korean banyan trees (Ficus annulata) lining the fence and the house exterior reduce the harshness of concrete construction and make the home appear more environmentally friendly. 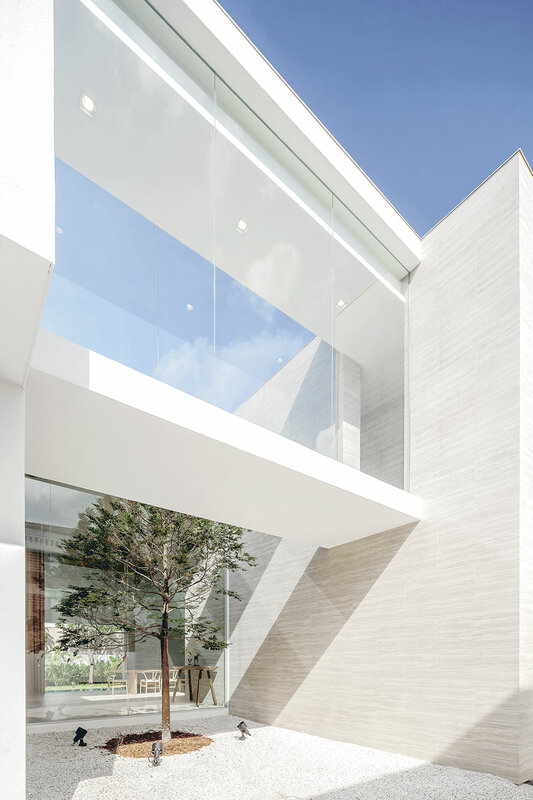 The house with 450 square meters of usable space boasts a bright and airy interior, thanks to open floor plans that emphasize interconnectedness throughout. 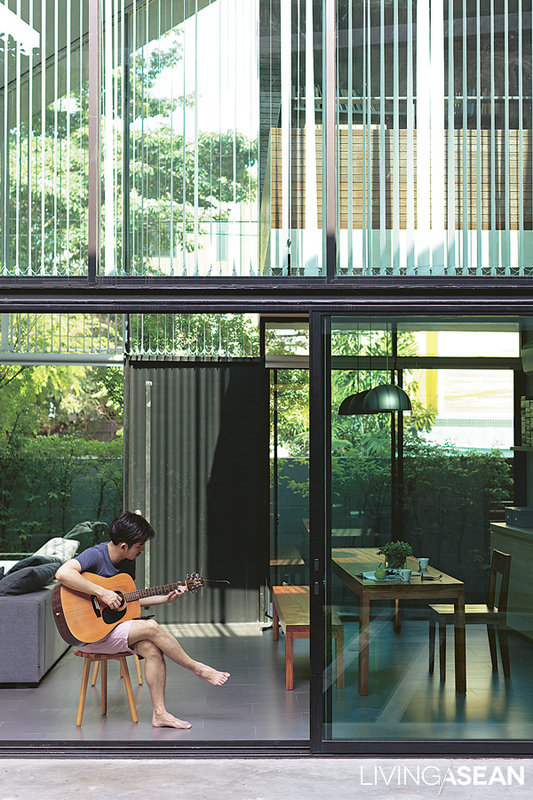 Modern glass room dividers promote visibility and warm social interactions within the family. 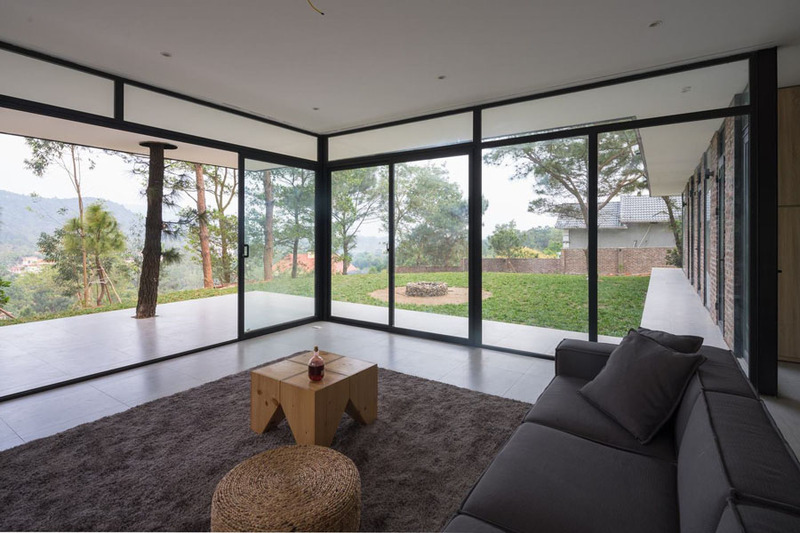 Steel construction saves time and makes the interior living space appear spacious and lightweight. In the end it’s all about feeling good and living better. “I made a walkway connecting to the courtyard that has become our sitting room. Using my stock of lumber and wood recycled from the old house, I mixed teak with Makha wood (Afzelia xylocarpa), and gave it a fresh layer of paint. It was a mix- match since the boards came in different sizes, but nothing serious. Now mom and her sister seem really pleased that it’s a nice spot to sit and catch the cool breezes. 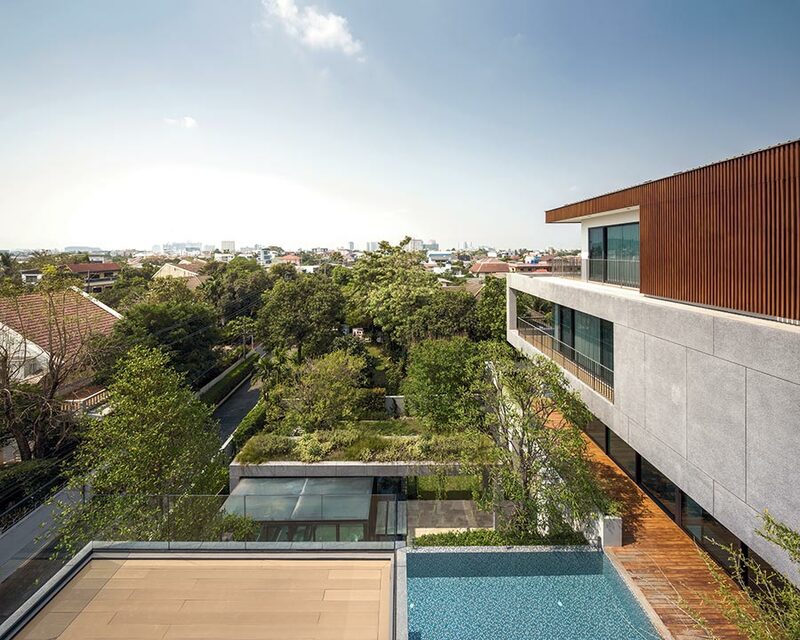 An empty space between buildings looks stunning from the architectural perspective. “For security purposes, iron latticework is preferred over solid walls. To keep the sun out, the perforate shell is lined with trees. There is an Indian cork tree (Millingtonia hortensis) that has grown tall to shade the interior and give sweet smelling white flowers. We also put in a Common Tembusa tree (Fagraea fragrans) which grows slowly, and a Brazilian rose wood (Jacaranda obtusifolia) which is loved for its beautiful purple flowers. The courtyard floor is covered by a container garden intended to make cleaning easy after seasonal heavy rains. It’s OK to get wet sometimes, but it’s better than being enclosed by solid walls,” Woranol explained. His choice of furniture speaks to the minimalist style of interior design. 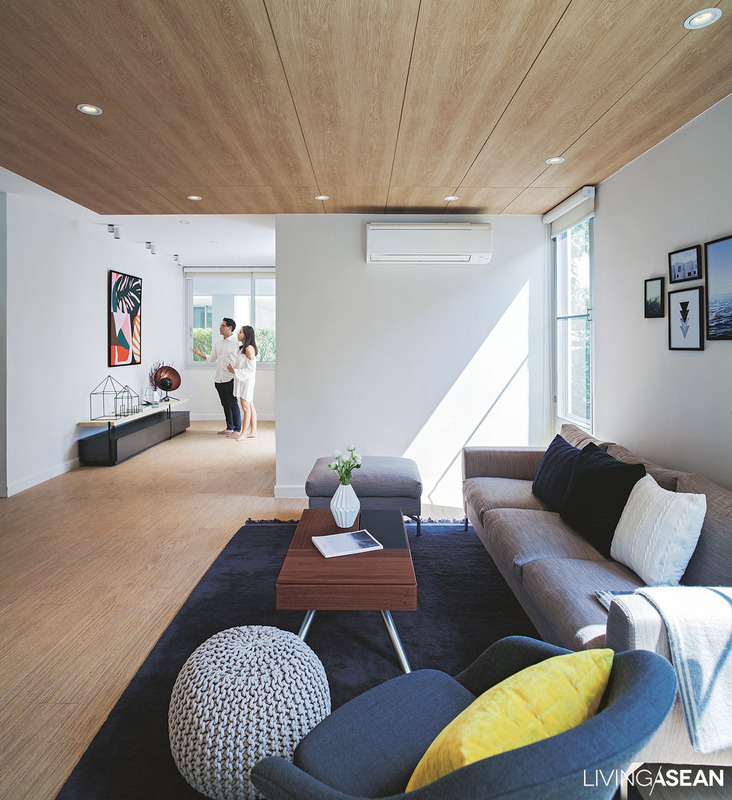 The idea of less-is-more translates into an interior living space that’s open, easy on the eye, and conducive to natural ventilation. It’s easy to get why everyone likes to hang out together in the hallway downstairs that connects to the lush courtyard garden. The natural environment helps them feel relaxed all day every day. 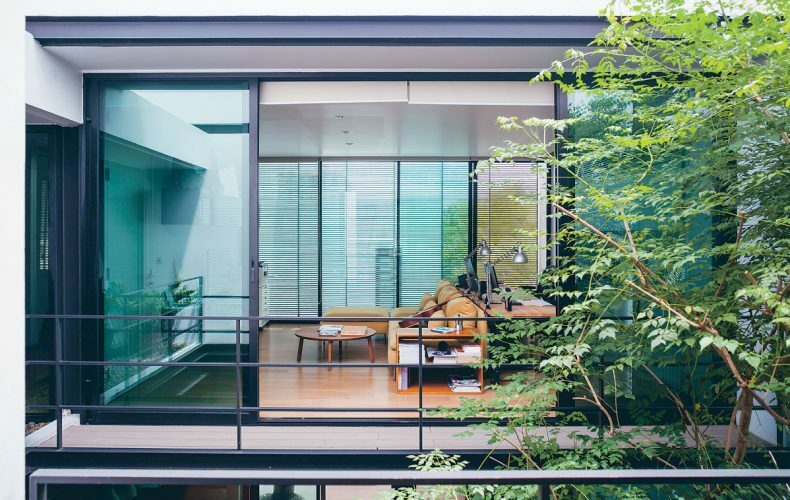 While lattice screens go to work protecting the home from the outside world, large opening glass walls connect the interior room to a lush courtyard garden thrown in between buildings. 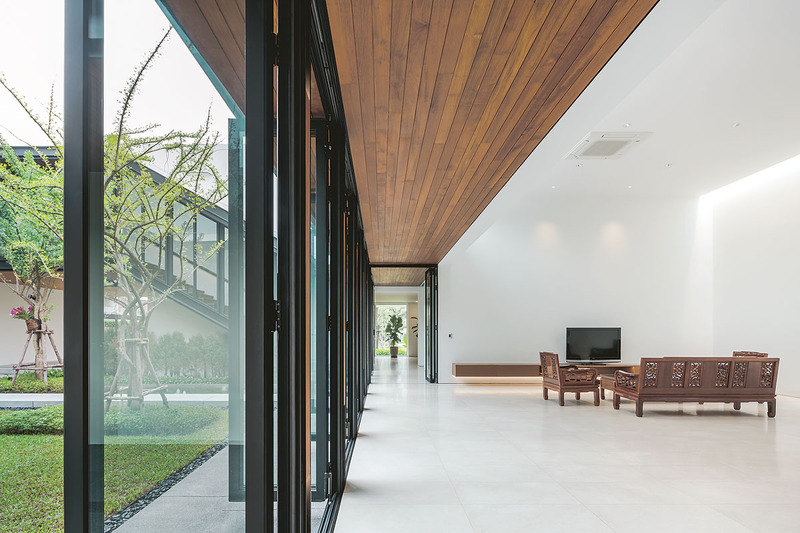 Diffused light and winds passing through the permeable shell keep the entrance hall cool all day without the A/C. No wonder it’s the family’s favorite hangout. Adjacent to the sofa set, the dining room is well lit and made comfortable by fresh air blowing in from the nearby courtyard garden. The raised passageway around the courtyard is built of old wood worn by long exposure to the weather. 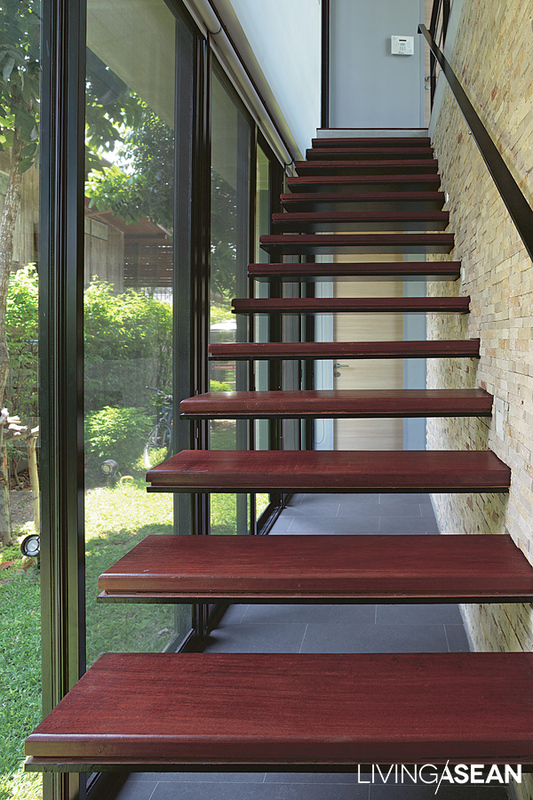 Concrete steps provide easy access to the garden floor. It’s a place to sit with your legs hanging down, enjoy a patch of greenery, and shoot the breeze on a lazy afternoon. 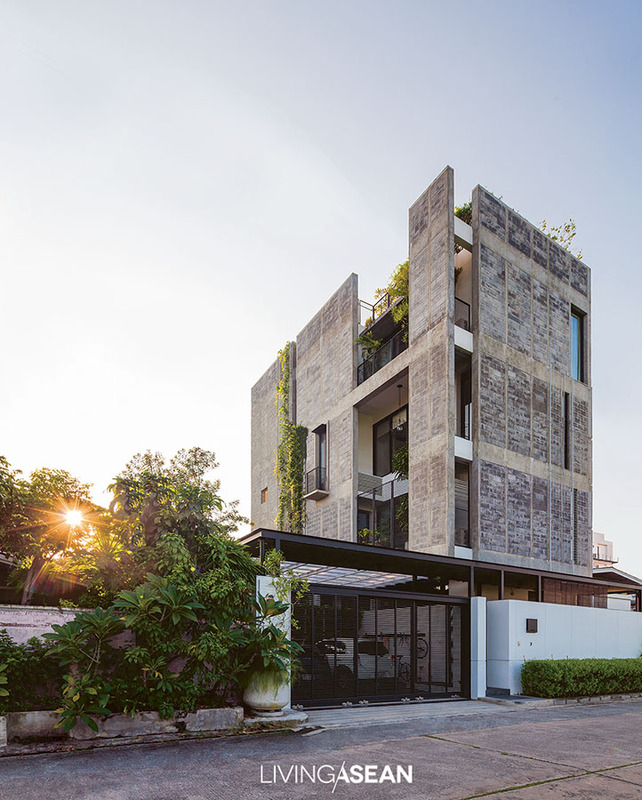 An Indian cork tree (Millingtonia hortensis), the courtyard’s main attraction, develops a healthy crown near the studio and the bedroom on the upper floor. 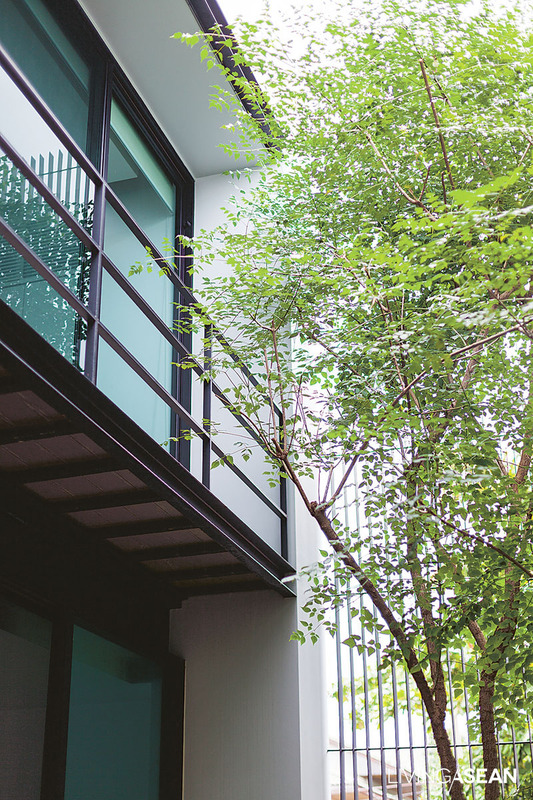 While they allow natural light and fresh air to pass into the courtyard, metal lattice panels also double as privacy screens and safety precautions against intruders. The room upstairs can be used for work or pleasure. Open the door to see what happens below, and take in the view of the lush courtyard garden. Some fresh air really will do you good. After all, it’s about bringing nature into the home. Rustling leaves in the Indian cork tree make a sound that has a relaxing effect, especially for the home office and the bedroom located across the yard. 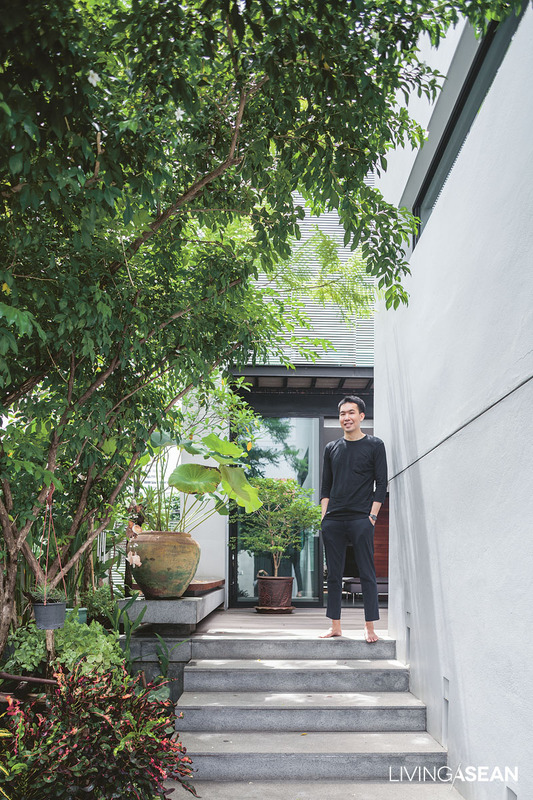 It’s next to impossible to find peace and privacy in the midst of movement and activity of Bangkok’s busy Sathu Pradit neighborhood. But this house is one that defies the odds. The freedom of being observed or disturbed by other people is accomplished in ways that most would deem impossible. 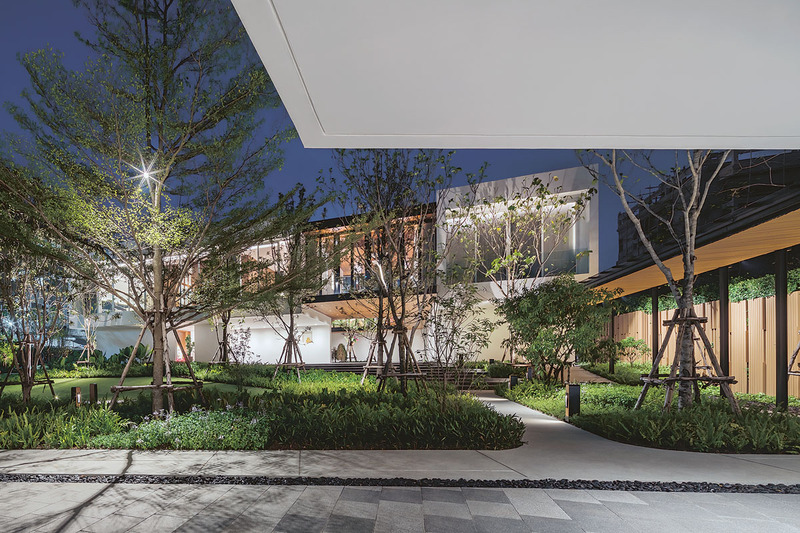 The difficult situation is solved, thanks to clever design and interior decoration by Integrated Field Co., Ltd. in collaboration with Na Laan Studio Co., Ltd. the landscape designer. The homeowners wanted a place in which to spend their post retirement years. That was the homework assigned to the capable team of designers at Integrated Field. They were looking at creating a home that would be the heart and soul of the family. That was the main idea that went into building this house on an area just shy of 2 Rai (roughly three quarters of an acre). There was a problem. The sun shining through the skylight above the courtyard creates a natural play of shade and dancing light as time progresses. The trees and vegetation beneath the canopy need sunlight to thrive. A set of steps lead to the house interior and the courtyard garden enclosed by the building. The land was in a densely populated area surrounded by high-rise buildings, especially in the north and west directions. 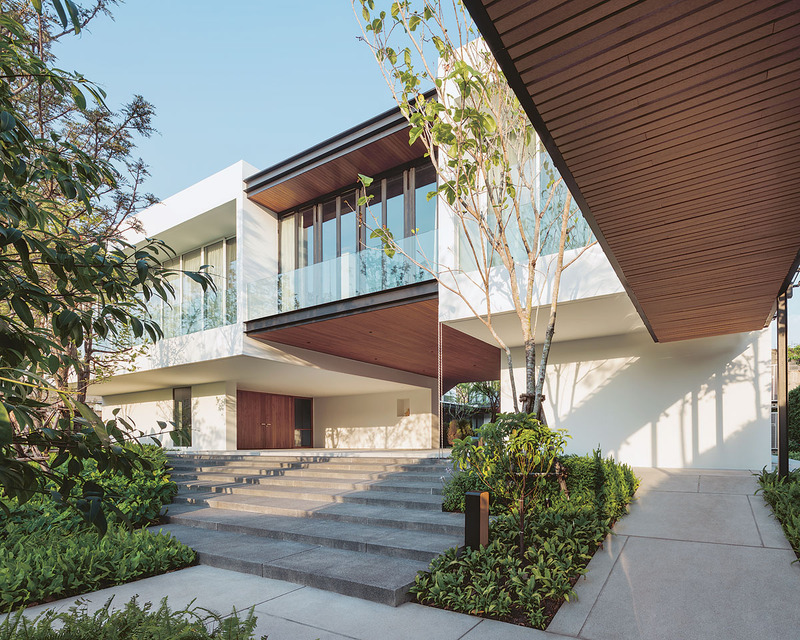 The architects dealt with the difficult situation by creating a home plan that wrapped around a lush central courtyard designed for the benefit of family togetherness. The house is now complete. The ground floor exists in open view, so everybody can participate in the activity. 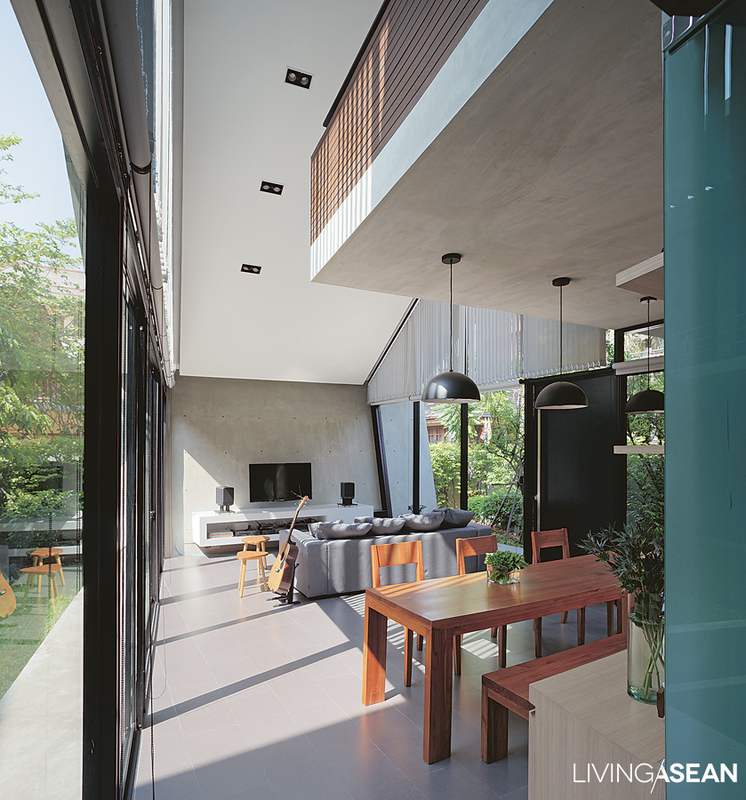 It consists of an ancestral hall, living room, and dining space with large opening glass walls. 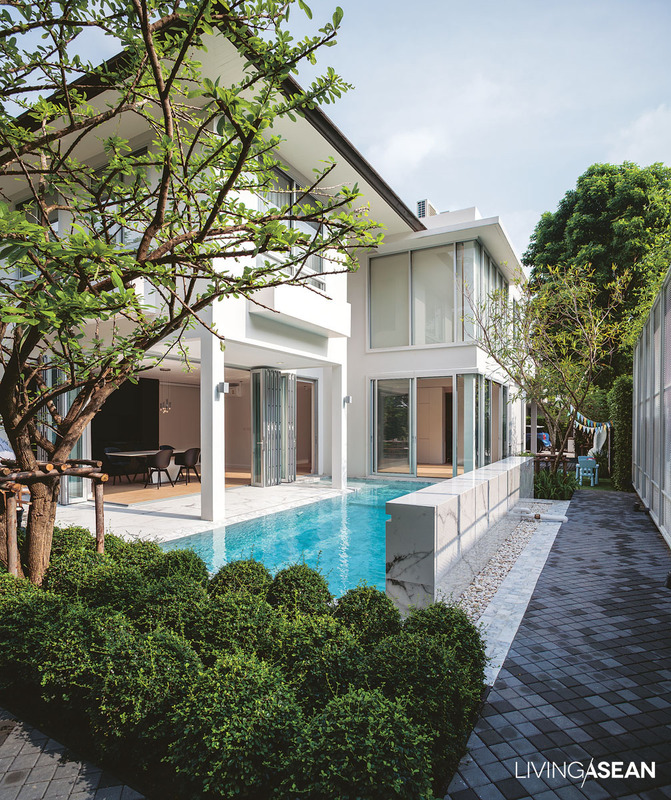 It offers the view of a central courtyard that’s made for family gatherings. There is visual continuity that allows everybody to be in the sight of everybody else. 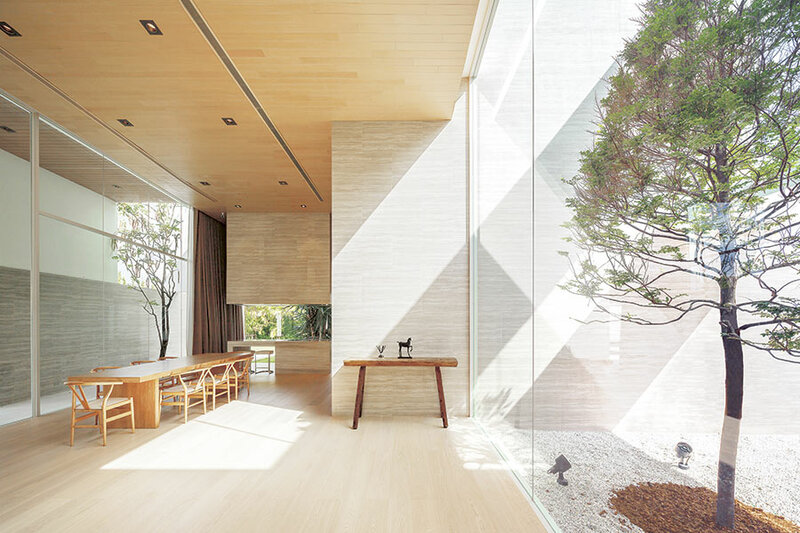 Only the service areas, such as the kitchen, bathrooms, and living quarters for housekeepers are separated from main hall design by a nontransparent wall. Silver oak trees (Grevillea robusta) come in handy to shade the house façade against the sun coming in the south direction. 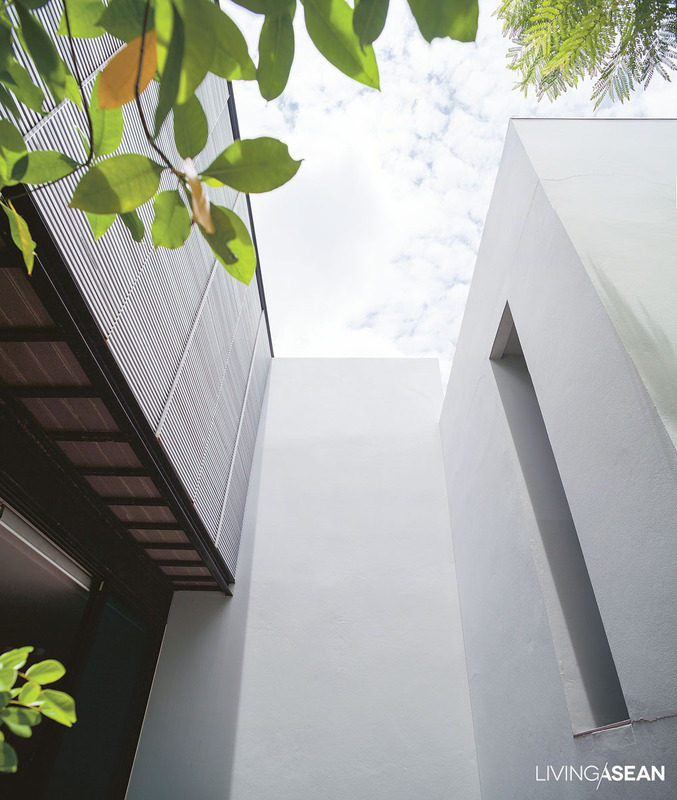 Striking the right balance between concrete and steel frames, the modern home leaves plenty of room for nature to participate. 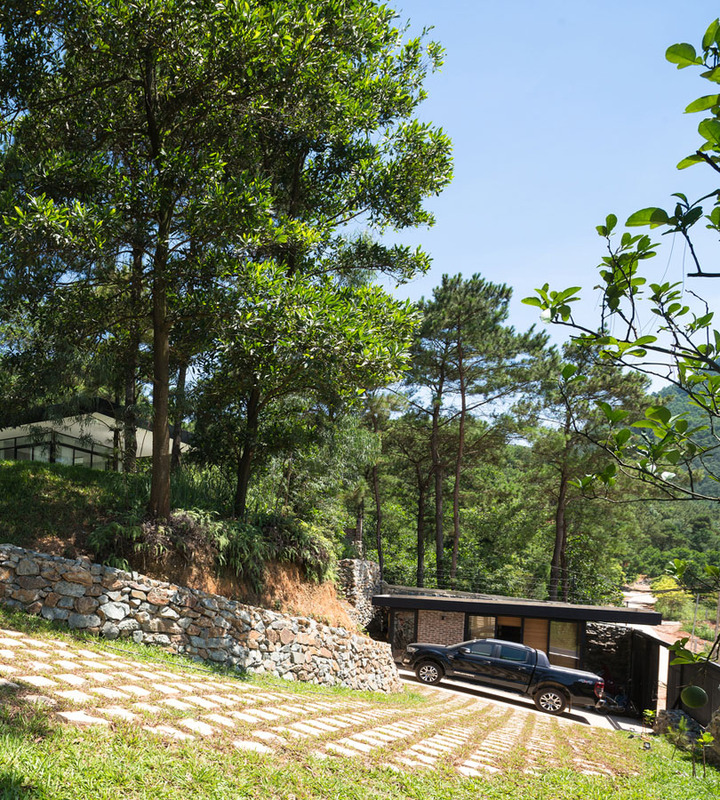 A flight of stairs leads to the bedrooms and personal offices on the upper floor. 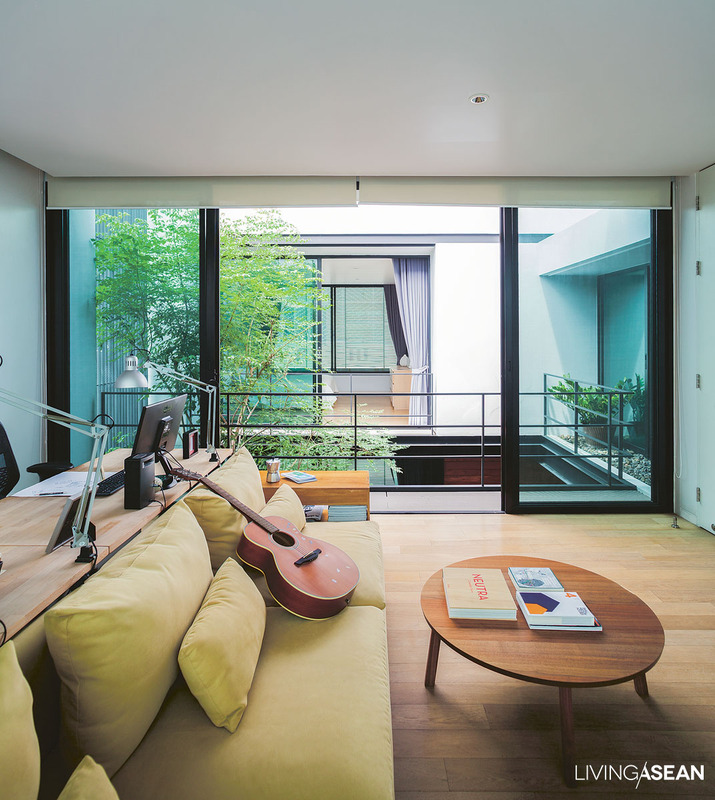 It’s designed to clearly separate public and private areas. 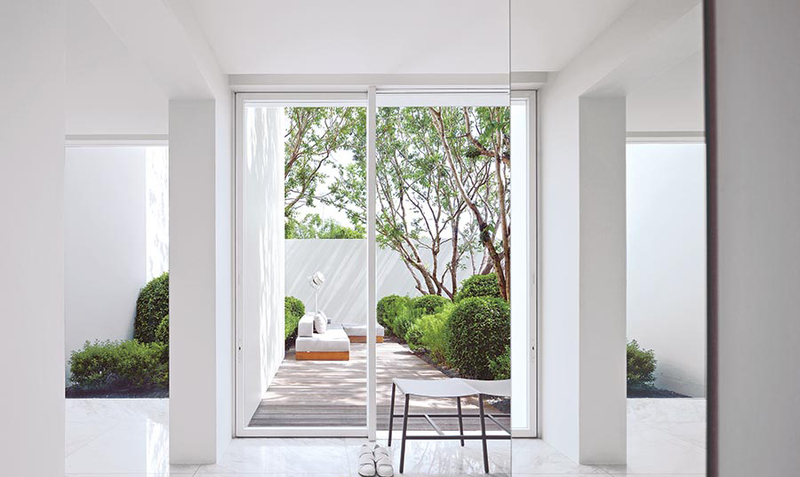 An array of bi-fold doors opens to connect to the courtyard garden and other parts of the building. Bright and airy design allows natural light and wind to blow into the interior all day. A Buddha room sits in the common area near a run of stairs leading to the upper floor that contains bedrooms for all family members. For the utmost convenience in modern living, each bedroom comes complete with a workstation, living area, a bathroom en suite. 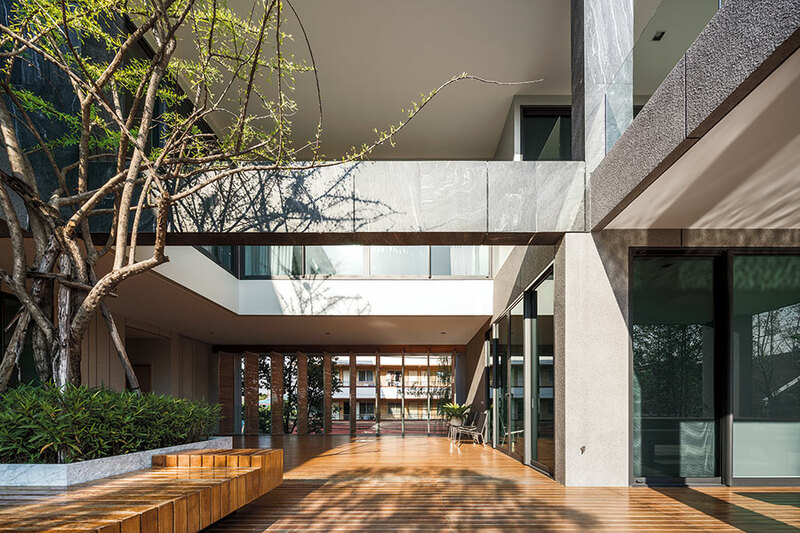 Apart from capacity for the interconnection among household members, the house’s most outstanding feature is contact with the natural environment that’s apparent in a lush inner courtyard. The building is oriented to have the front façade stand facing south, a direction that isn’t likely to be observed or disturbed by other people. It stands to reap the full health benefits from southerly winds that keep the house cool naturally all day. In so doing, an array of bi-fold doors is installed, while transom windows are fitted with nets for ventilation. 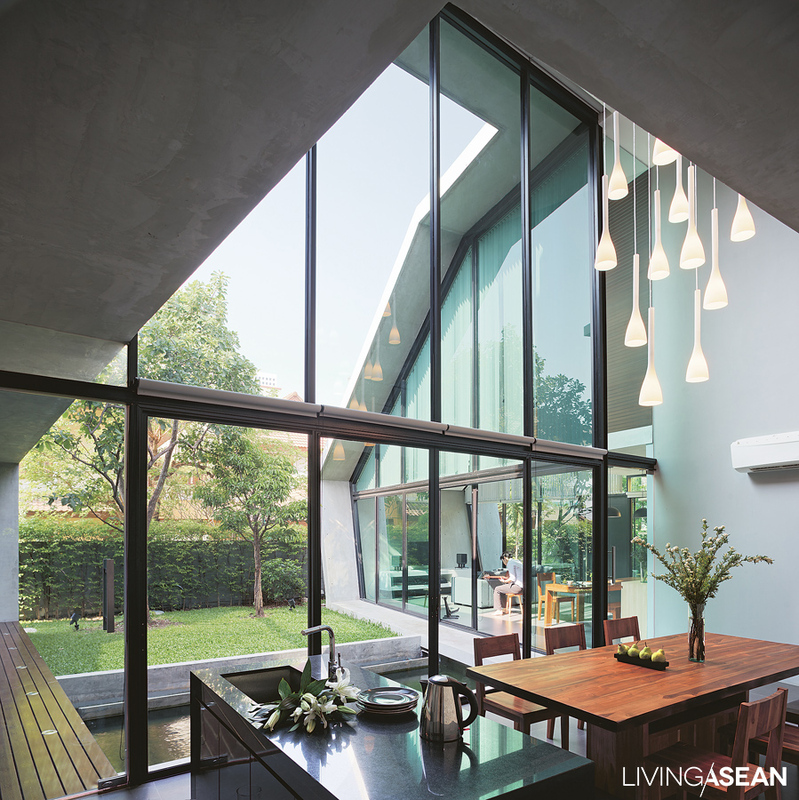 Meantime, a skylight that illuminates the interior also doubles as engine that drives natural air circulation. On the side that’s exposed to intense sunlight, double concrete walls are installed, while the windows are fitted with insulated glass. 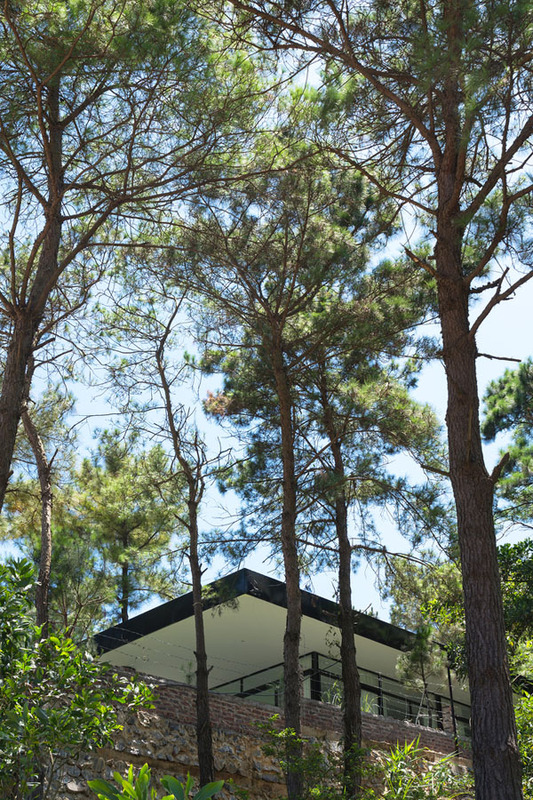 Outside, the walls are canopied by overhanging trees that have become the house’s first layer of protection from the elements. What’s obvious here is that design isn’t about bricks and mortar alone. Rather, it has a lot to do with promoting the comforts and quality of life for people living in it. As this house has shown, it pays to have a good grasp of the location and ability to overcome the challenge in the most effective way. By keeping the hustle and bustle of the city life outside, peace and tranquility at home is accomplished. 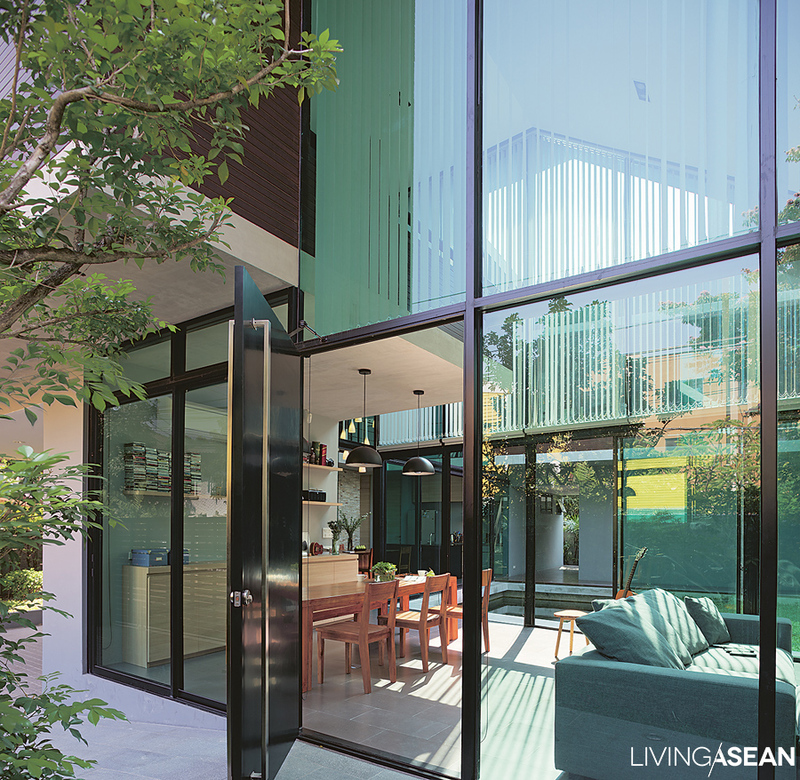 Plus, it’s a lush courtyard in the design that adds up to a salubrious atmosphere in which to live. 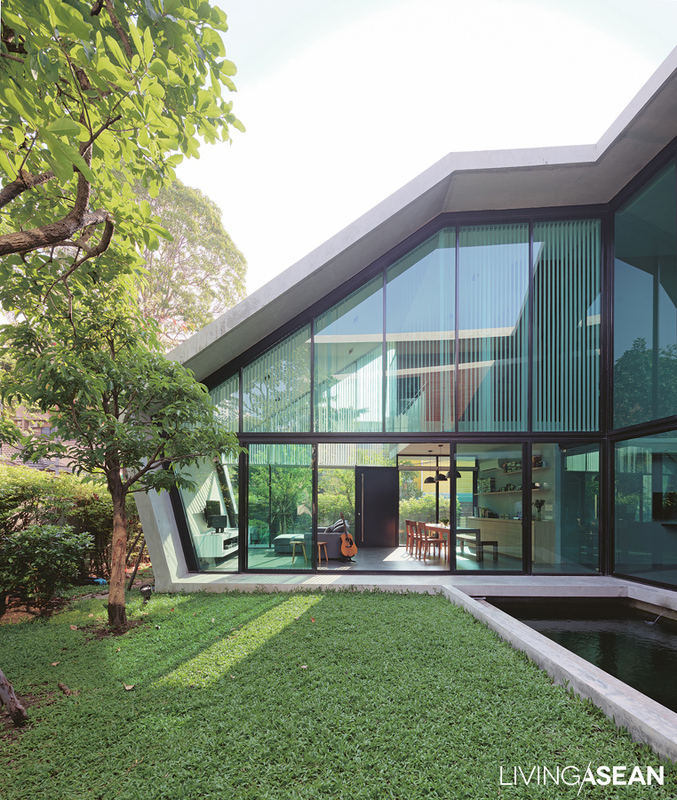 There is visual continuity from the interior to the courtyard garden, thanks to large opening glass windows. Spacious rooms with just a few pieces of chinoiserie furniture bespeak minimalism in interior design. 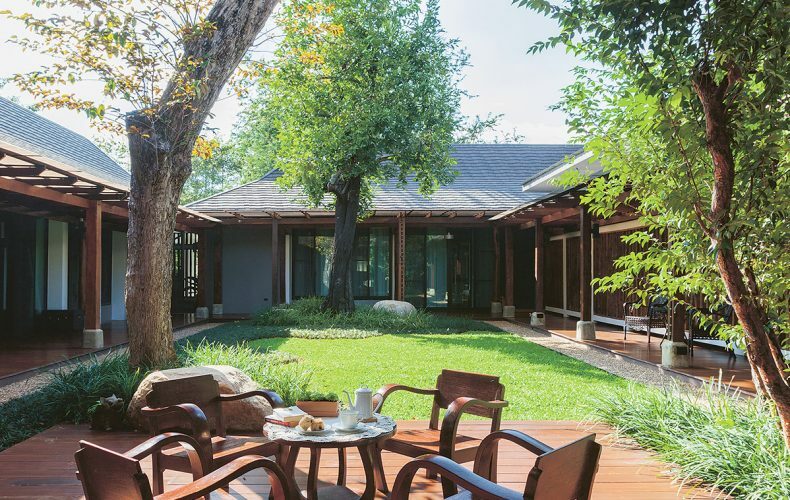 Every room is bordered by large opening glass walls overlooking the lush courtyard garden. With few material possessions, the interior is plain and simple with nothing to clutter up the hallway. 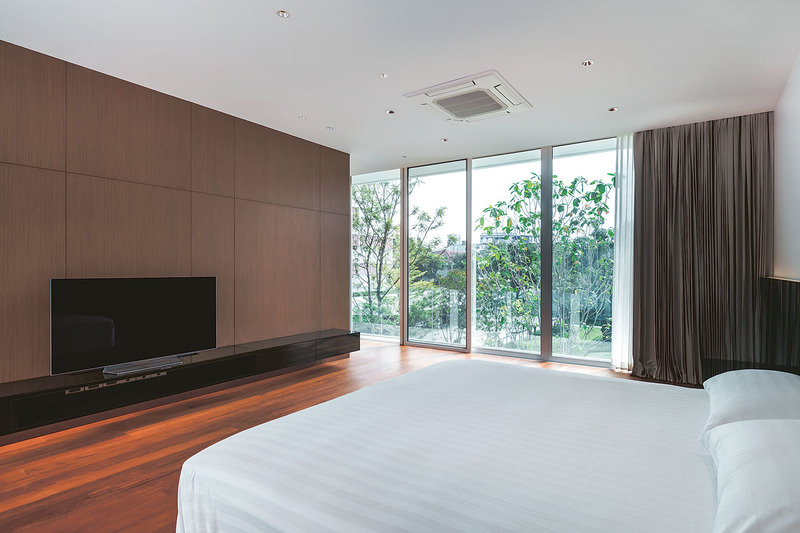 All the bedrooms are fitted with insulated glass to protect from solar heat gain and reduce noises from the outside. 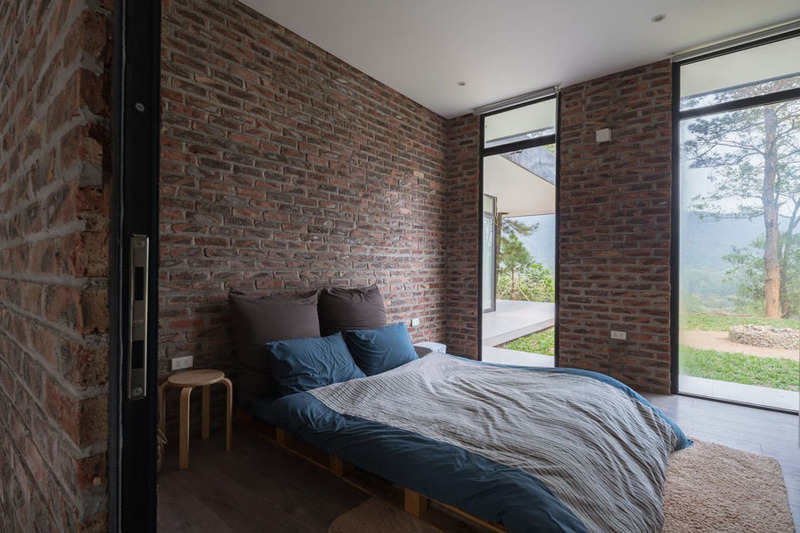 Equipped with everything necessary, the bedroom is a personal sanctuary that’s comfy, simple and clutter-free. 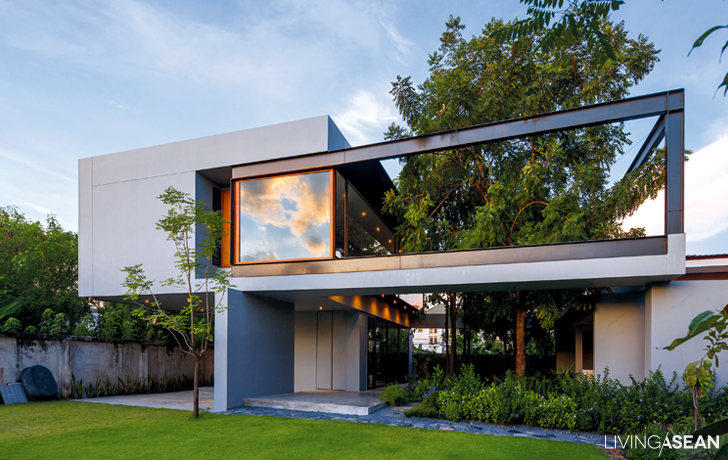 It’s bordered by large opening glass walls designed to take in the view of the lush courtyard garden. 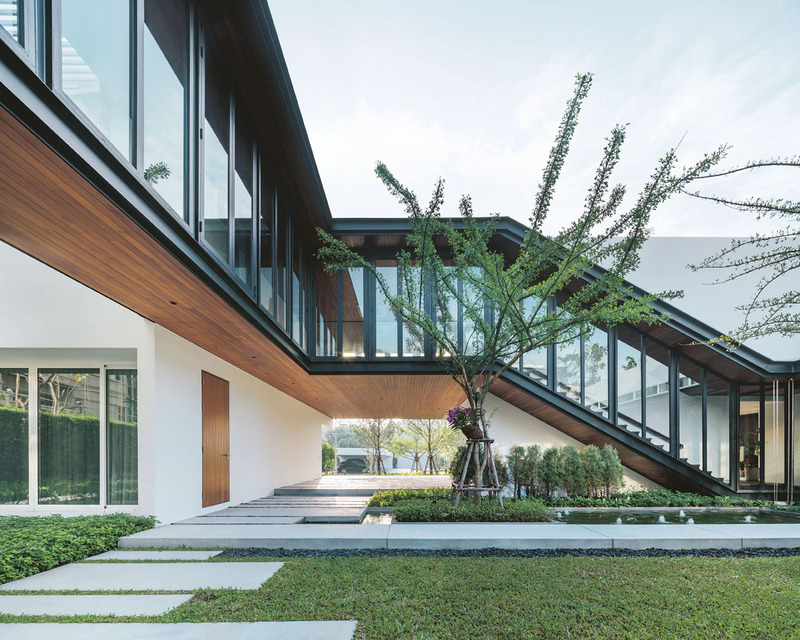 Two walkways connect to the house. One starts from the carport. The other is a covered pathway designed for the elderly. Pok (Attaporn Kobkongsanti), his wife Romanee, and their young son Phumi have just moved into their new house, which took six years to design and build. 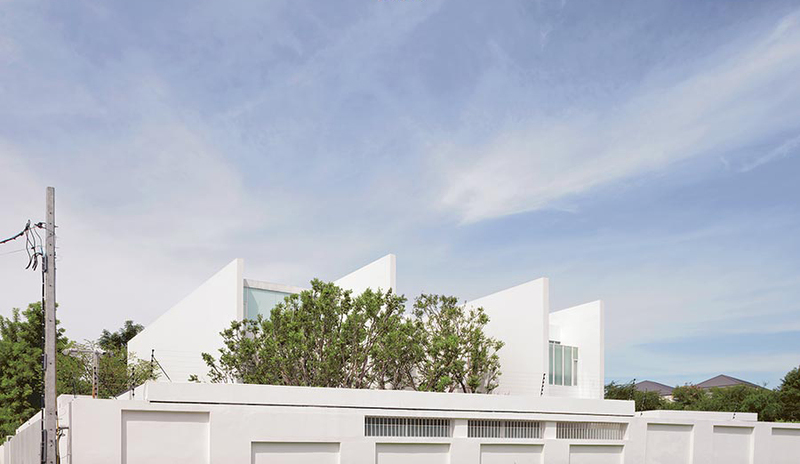 Now it shows a perfect picture, lofty white walls rising above its inspired design and meticulous construction. 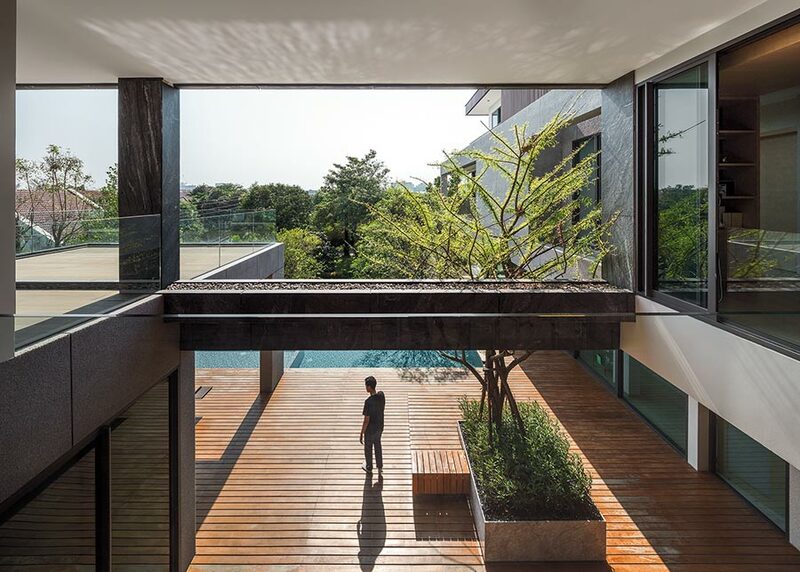 “As an architect myself, I imagined a courtyard here. 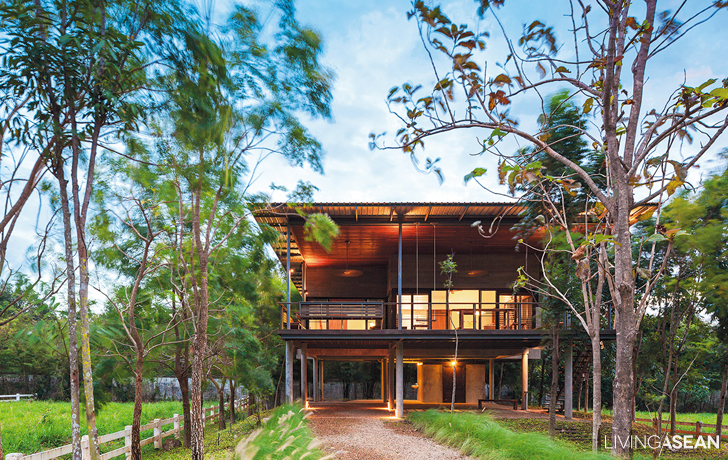 Having worked with Boonlert, I felt our styles were really in sync, and after a few iterations we settled on our fourth design, which is what you see here!” Pok, who is the owner not only of the house, but also TROP Landscape Architects, is referring to Boonlert Hemvijitraphan of “Boon Design,” his co-designer. 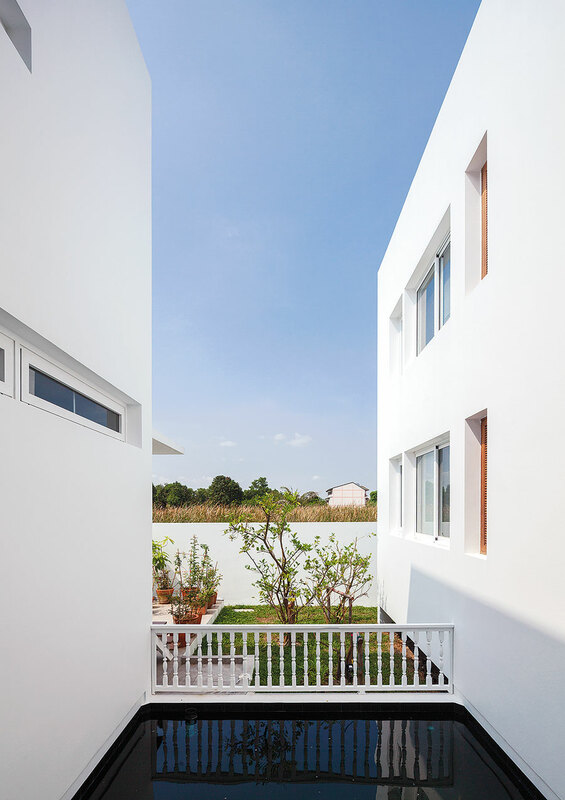 To the architects, “series of wall” is expressed with four very tall walls set in parallel that establish the frame of this 3-storey house. 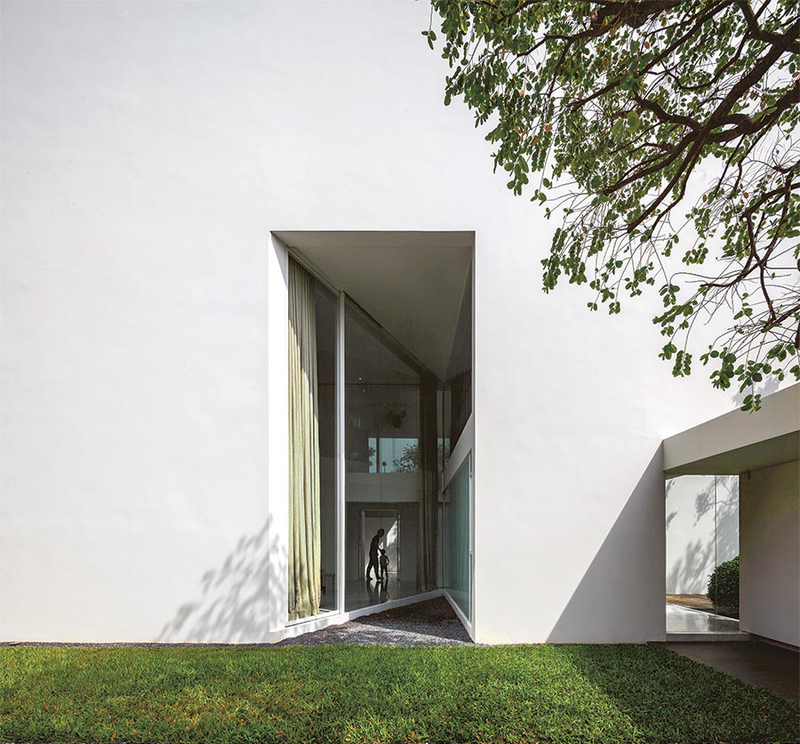 The walls are set between 2.5 and 5 meters apart, protruding out beyond the main body of the house, with varied height and length according to functionality of the spaces between. Floor 1 holds living room, dining area, and kitchen. Husband and wife have a workroom on the 2nd floor, and bedrooms are on the 3rd. 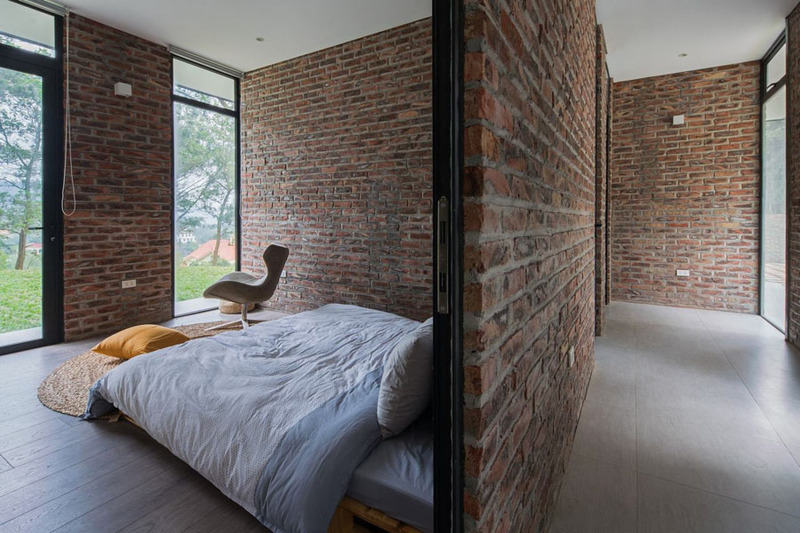 Closing off areas between walls before assigning them functions as rooms gave the look of, as the architects put it, “putting people in the in-between spaces.” Areas of use are rectangular, enclosed lengthwise between the walls. 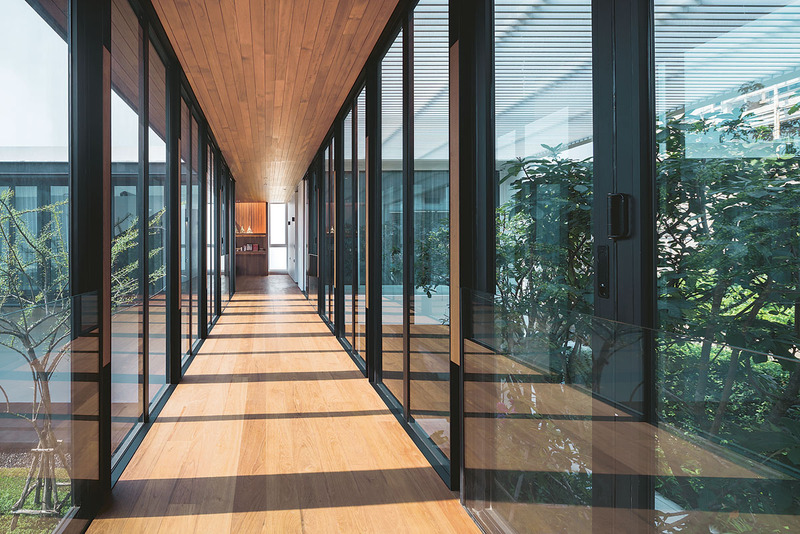 The front and rear of the house are all floor-to-ceiling clear glass, for a free, airy feeling everywhere, the natural world outside shining through into the home. The walls are thick, blocking the sun’s heat from the north and south. 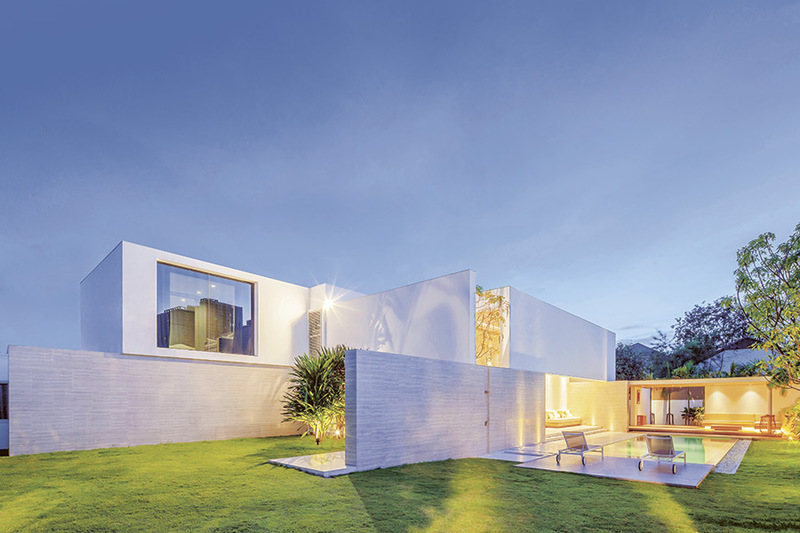 The glass sides bring in the sun’s natural light as it moves from east to west, keeping the house bright and cheerful all day. 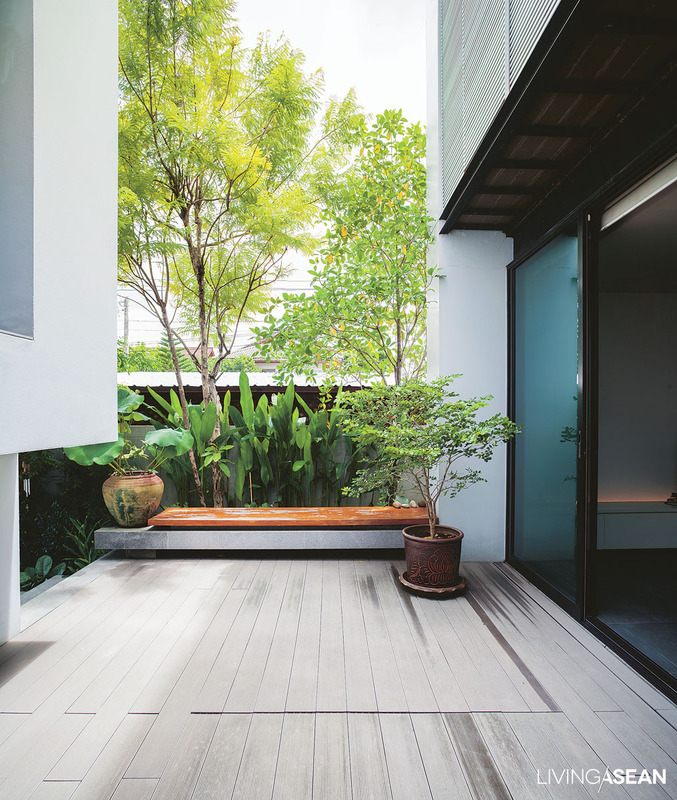 The walls also facilitate inner courtyards that are part and parcel of the livable space and bring the outside garden in, using the owner’s unique talents and experience to incorporate landscape architecture into the building itself. “This wasn’t easy,” said Pok. “We wanted it all, here, there, everywhere, but when you do it you always worry it might be too much! We went back and forth, and in end we chose the most orderly form.” The personalities of the in-house gardens differ according to position. At the east entrance we see a mixture of kitchen vegetable and decorative garden they call the “moon garden,” since a moonrise is especially gorgeous from there. Special attention was paid to its beauty, as it is the first garden we see when getting out of the car and the last before leaving. 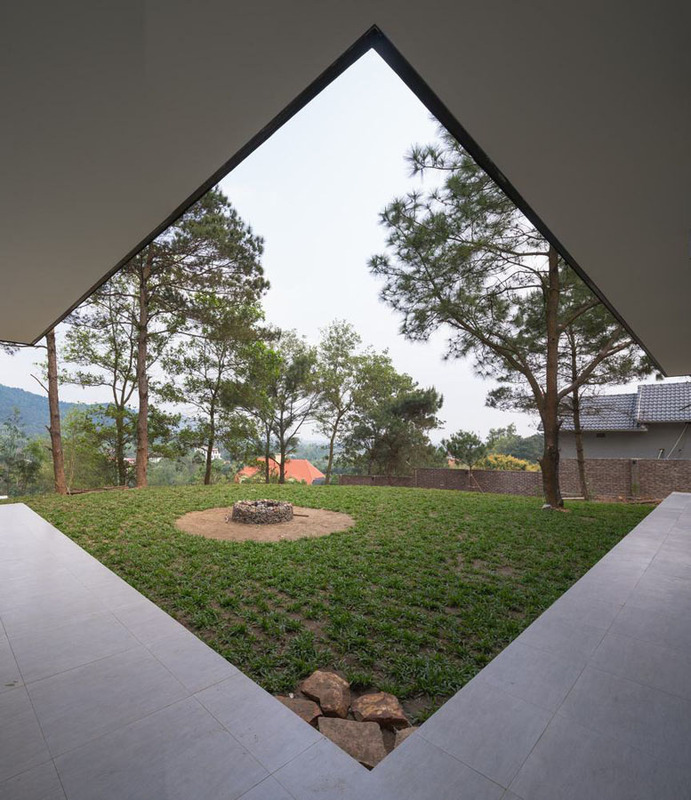 Next we encounter a triangular courtyard, inserted in the living room! 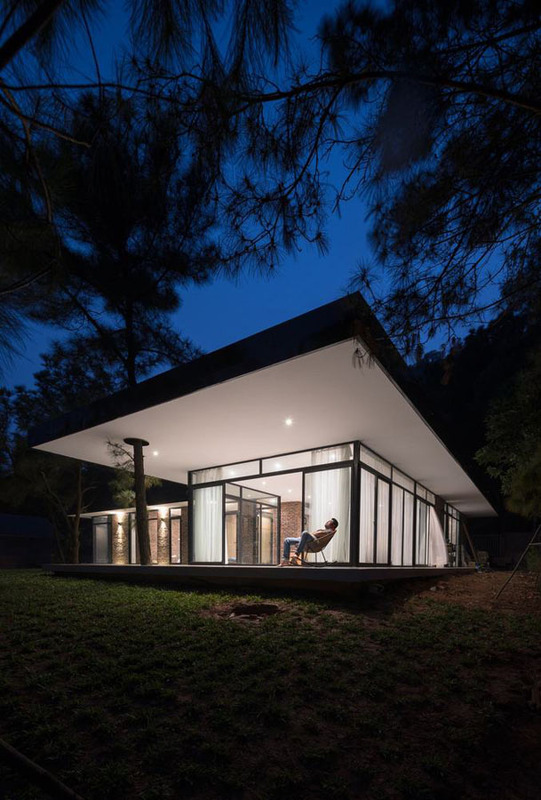 This is an architectural artifice to bring light into a darker area. 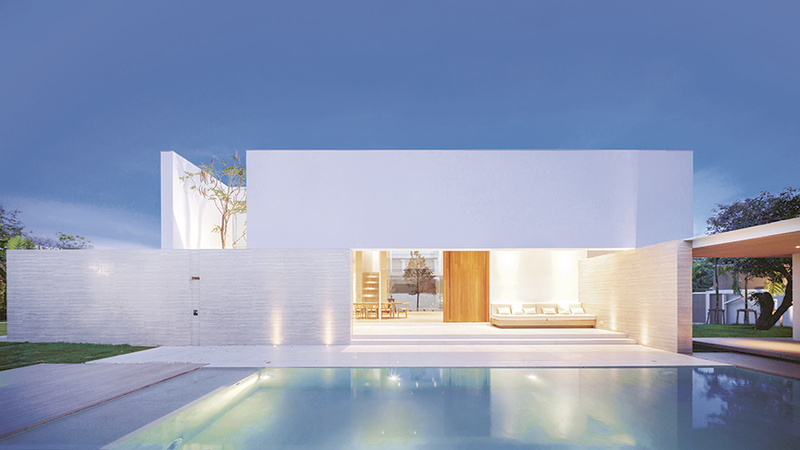 It opens the living room right out on the swimming pool and at the same time welcomes us into the room, creating an intriguing space facing both inward and outward. In the kitchen there’s yet another large courtyard. 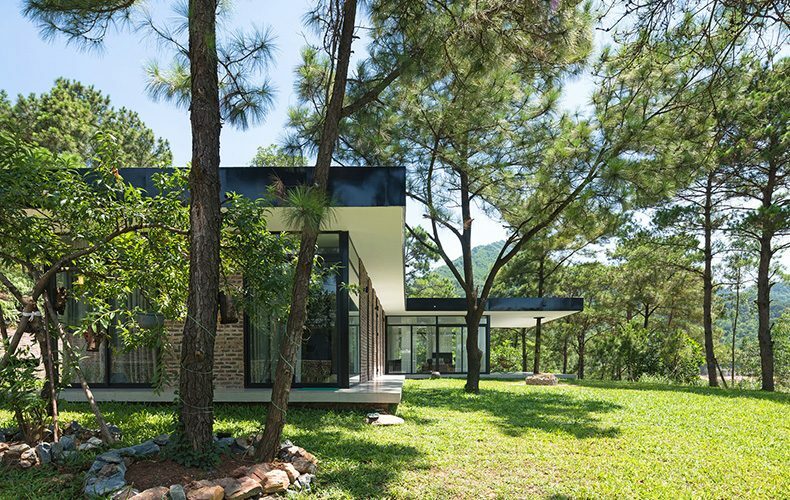 This one helps draw light and clean air into the various rooms from the topmost down to the ground floor, and connects with a forest garden behind the house to the west. 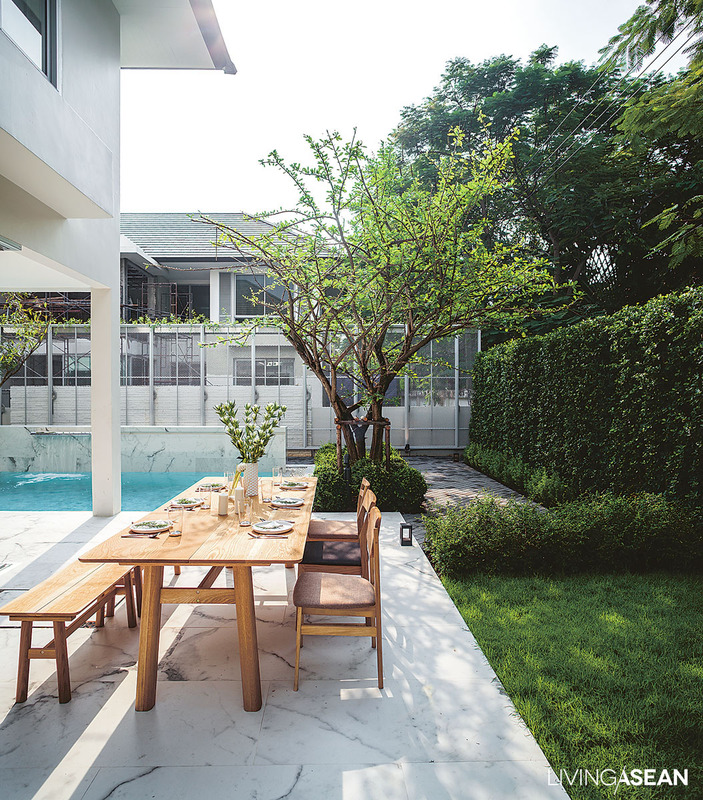 Between house and fence is a copse of trees that filters the afternoon sun, a space used just to relax, or perhaps for a party. 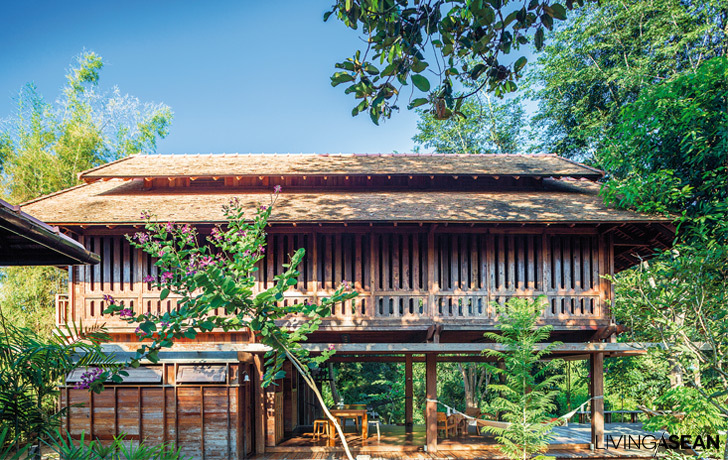 The L-shaped swimming pool is landscaped in with a neat wooden porch that fits perfectly with the tall trees Pok has freely planted all about. 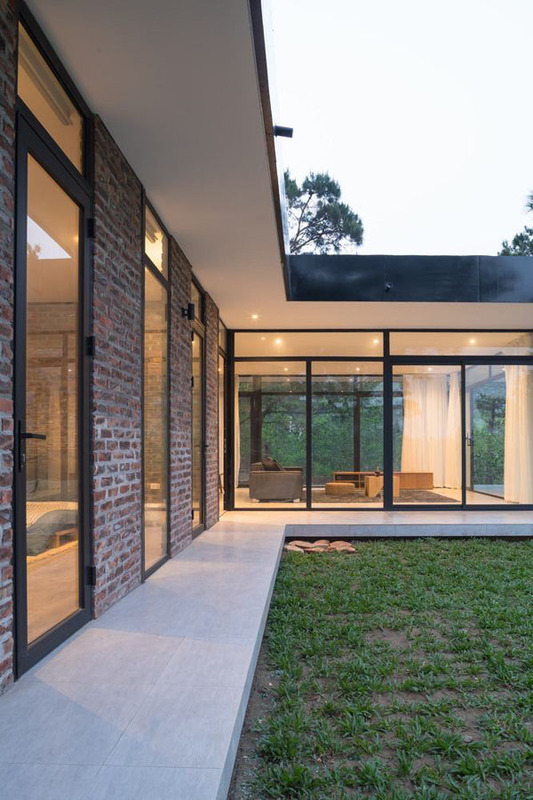 This garden also connects to the living room through a large clear glass door, creating even more unity between indoors and outdoors. 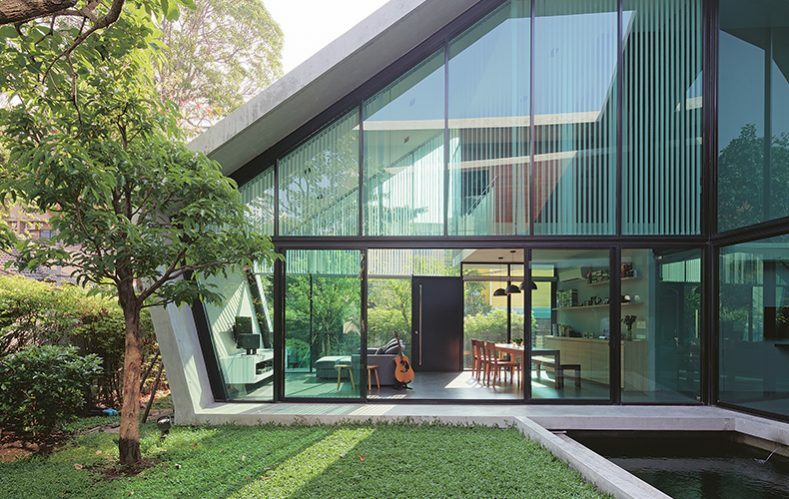 The house glass reflects the darker forested area in a wavy green. 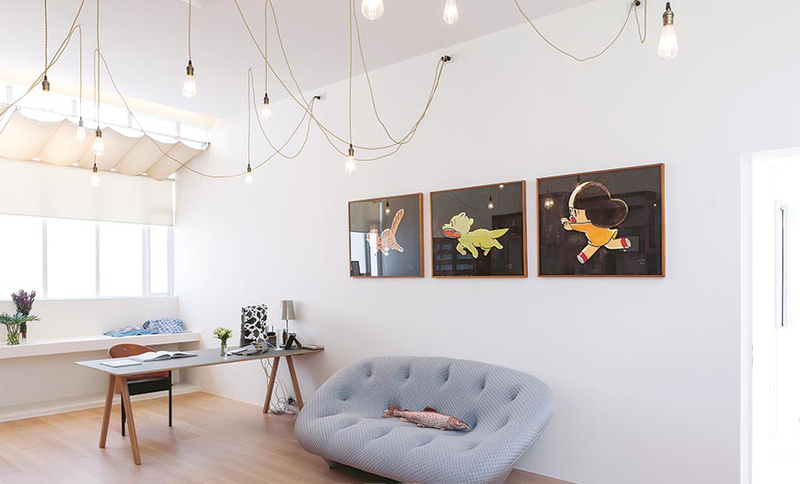 Our landscape architect compares it to an abstract painting by nature itself, saying it took away any need for hanging pictures on the walls, which are bare, like a white canvas, waiting for nature as the single artist to brush it with light. 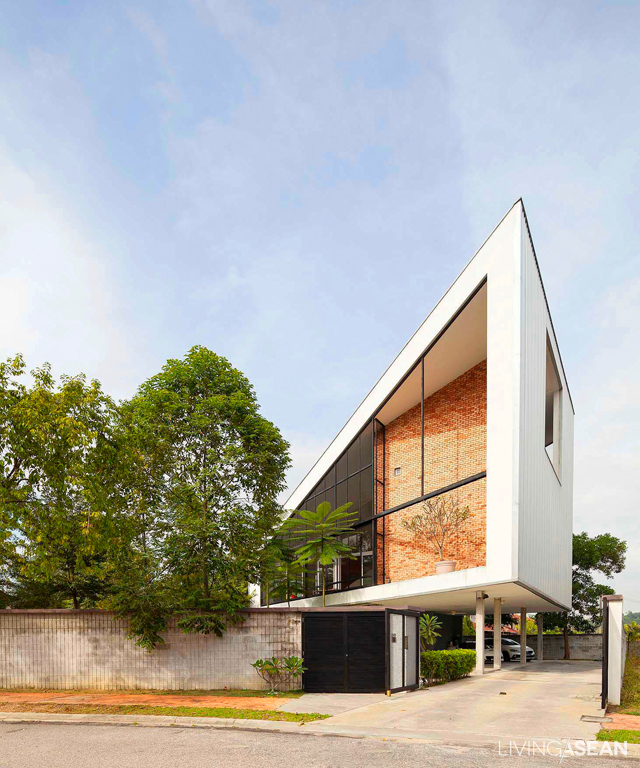 Secluded behind what appear to be walls of white paper, the “PA House” is IDIN Architects’ innovative integration of contemporary tropical architecture with a unique solution to its site-specific environment. 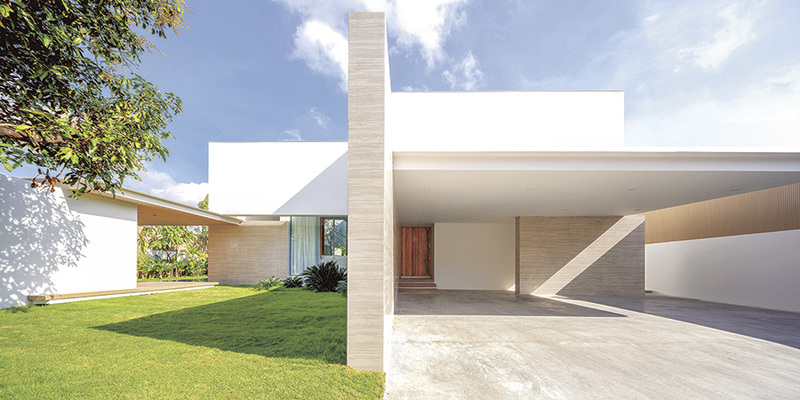 The architects observed, took pictures, noted directions, viewpoints, levels, and distances between houses, and analyzed the collected data to feed into their design plan, and came up with a concept that used these surroundings not as a limitation, but, surprisingly, as a help. 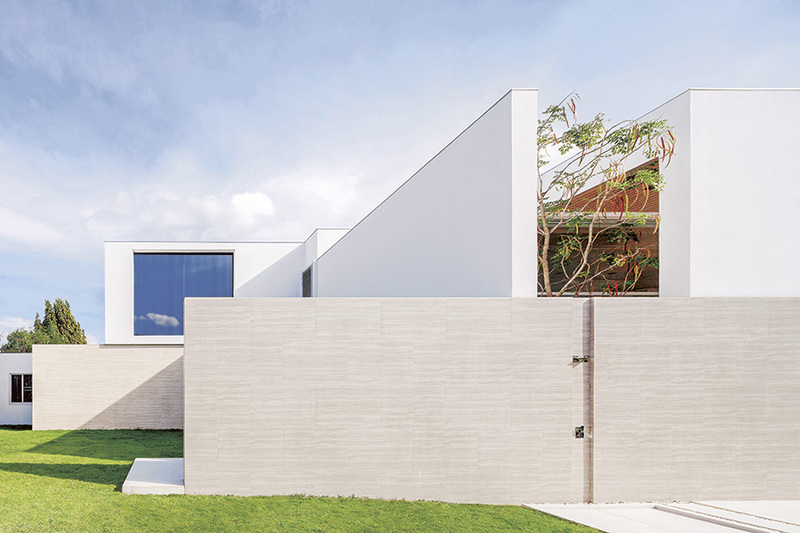 The concept of a “viewpoint” may seem abstract, but the relationships formed by viewpoints to and from surrounding buildings has turned out to be a primary factor in the straightforward design of this home. 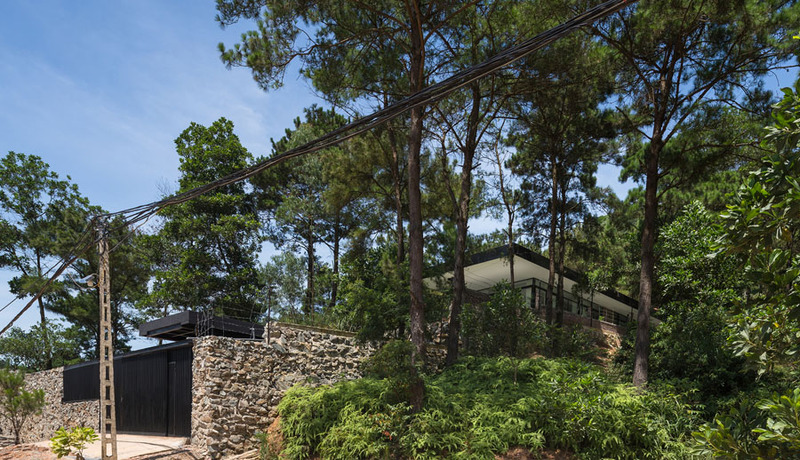 Each wall was placed to help deal with problems that might arise from its geographic situation, and also adapt open space inside the walls to enhance utility and the livability of the house, as its “conductor” architect performed his work. Coming in on the south entrance road, we encounter two planes meeting in a tall, wide “L” appearing to float out from the second floor of the house. This construction benefits the house much as a raised hand can block sun from burning our face. The ground floor is cool and shady, but still has a great view of the wide, open garden directly outside, while the upper wall both blocks the view from other houses and insulates against heat. 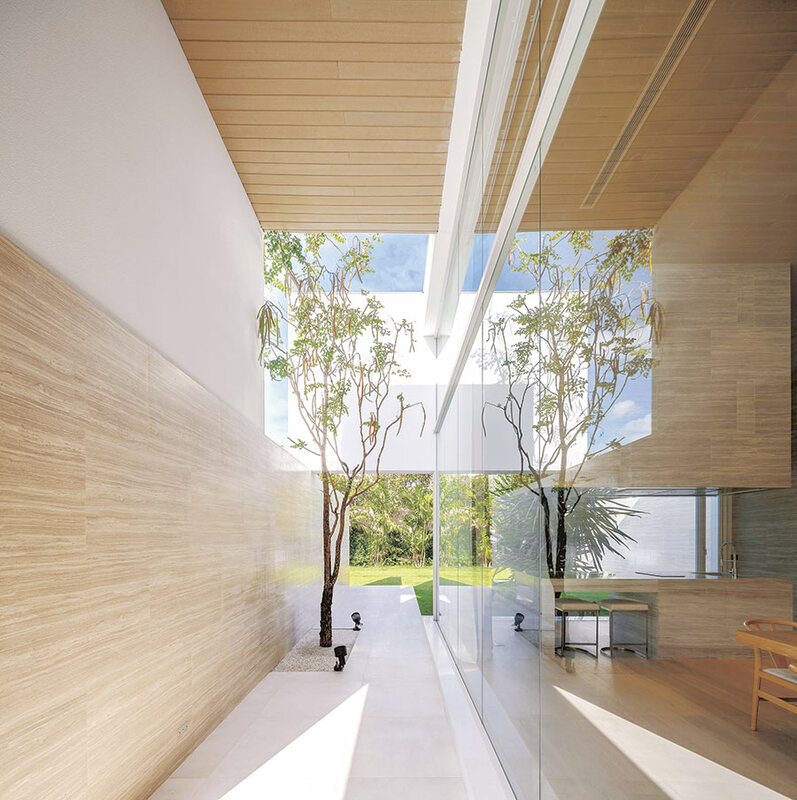 Along this section of the lower floor a wall also is set two meters out from the house to create space for growing plants, and glass walls reach up another 6 meters for a look out through the shade, where we watch the sunlight trace down the inner wall, creating new dimensions and an open, airy feeling. 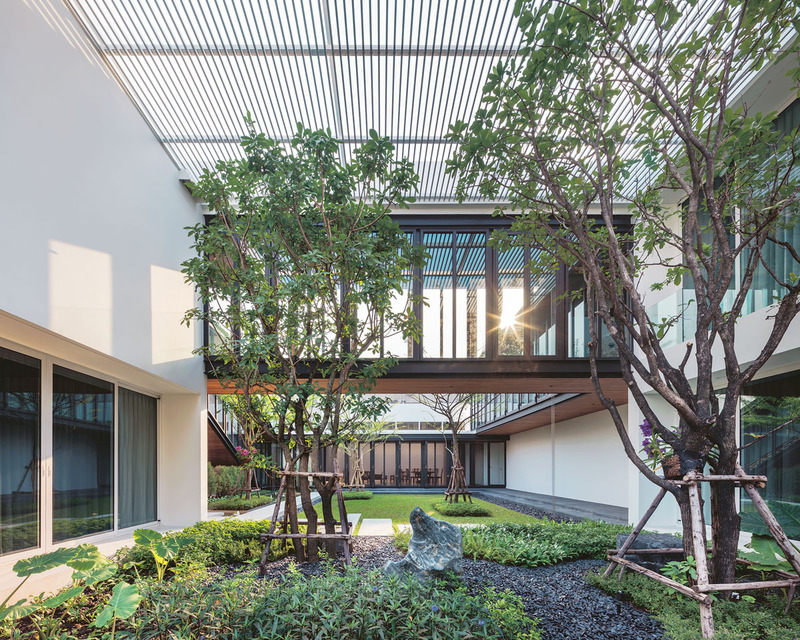 “The primary design is all about controlling sunlight and creating balance between outside and the outer and inner courtyards. 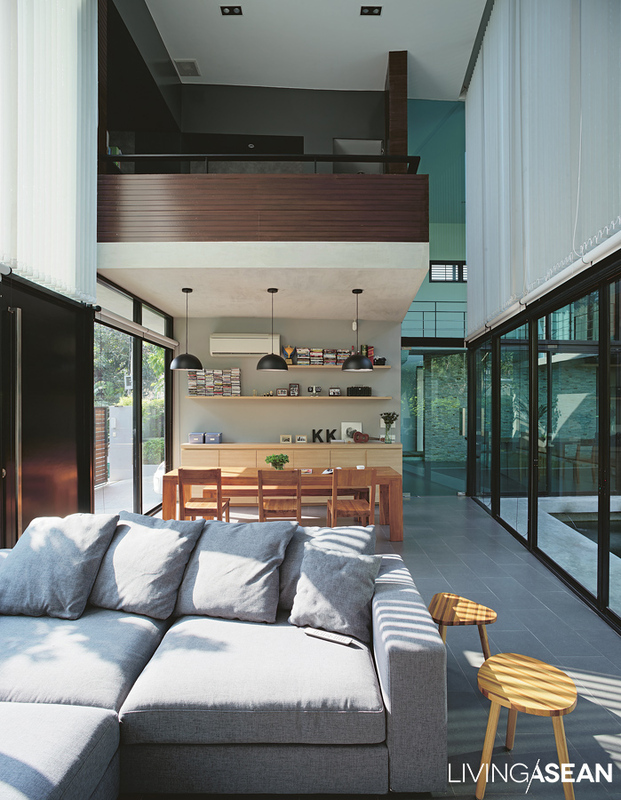 The home is open and airy in every direction. 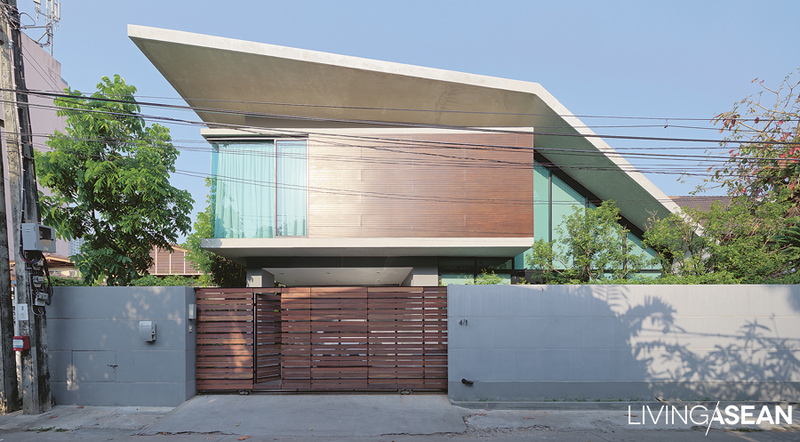 The horizontal “wall” above looks almost like a hat on the house, and functions both to block harsh light from the sun and create a wide open view at eye level. 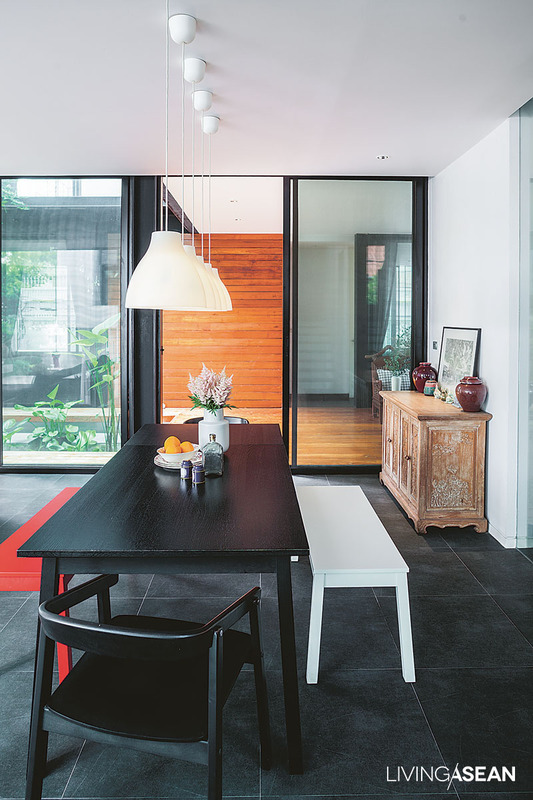 A large intergenerational family calls this house home. With family members from 8 to 84 years old, what stories it tells! 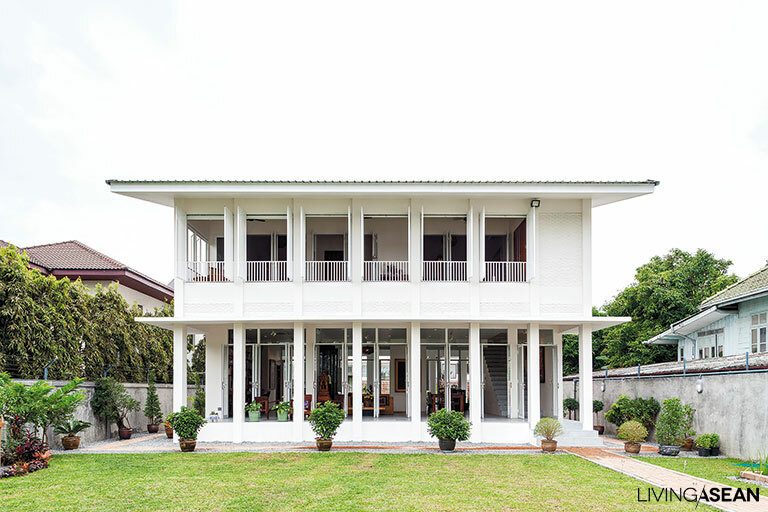 Here belongings passed down across nearly a century give a sense of “Thainess” to every corner of its modern design. 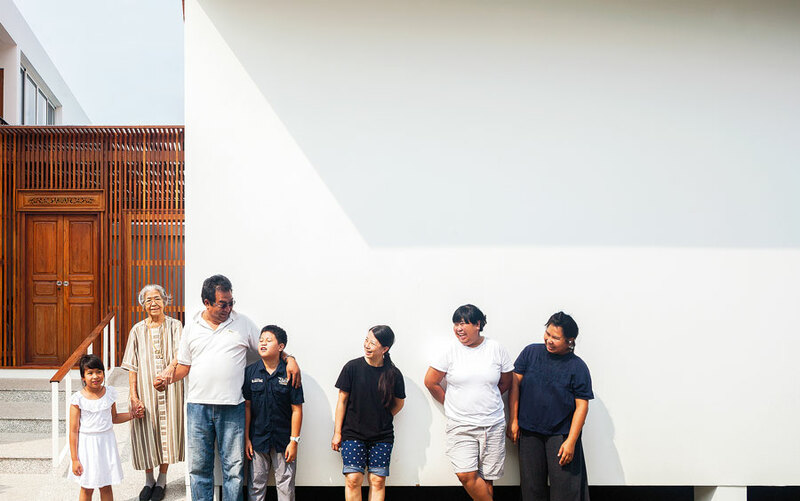 Long-time community worker Patama Roonrakwit, Case Studio architect who designed and owns the house, created it from her knowledge of the ways and tastes of all its residents in their old home. 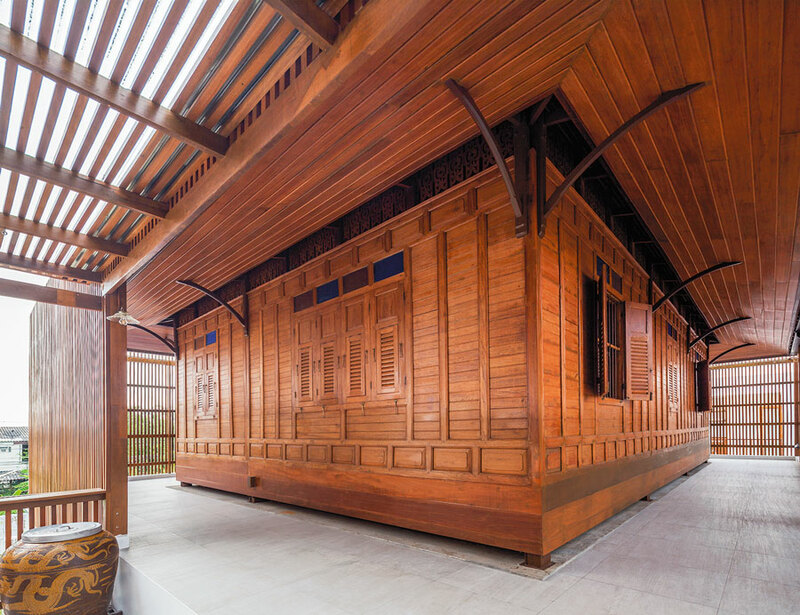 In a unique adaptation and fundamental design difference here, she preserved an old wooden house Pong’s grandfather had built, hiring Chinese craftsmen to raise it up to the second floor of the central building so family members could continue to experience its warmth. Besides this, the home contains the offices of Case Studio Architecture, Ed The Builder Contracting, her brother’s tour company, sister’s music school, and guest rooms where friends can stay. All this had to fit in a space of 1 rai (.4 acre), a narrow, long north-to-south lot. 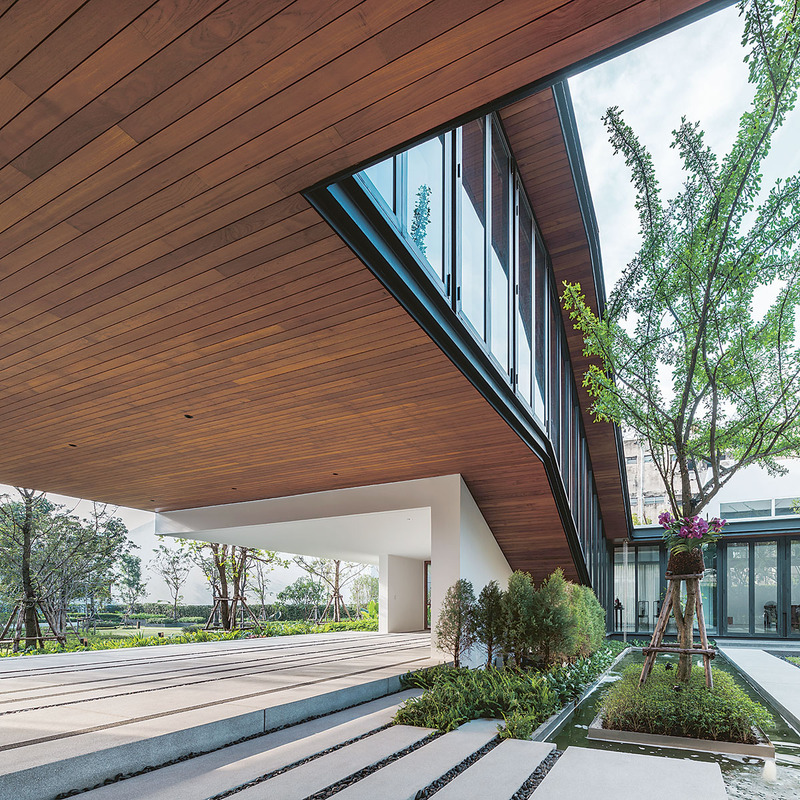 The building divides into seven sections, some of which are open, verandah-like corridors that give an angular definition to the space, trapping the wind and making for good air circulation throughout. 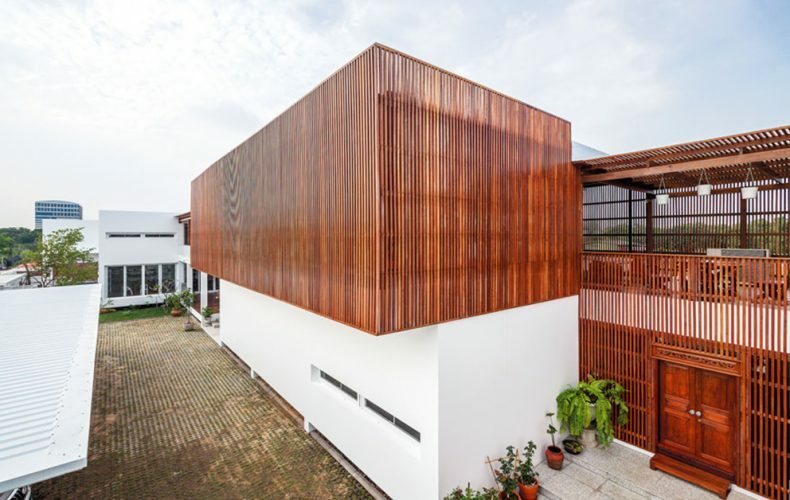 Wooden slats guard against sun and wind and create visual harmony. 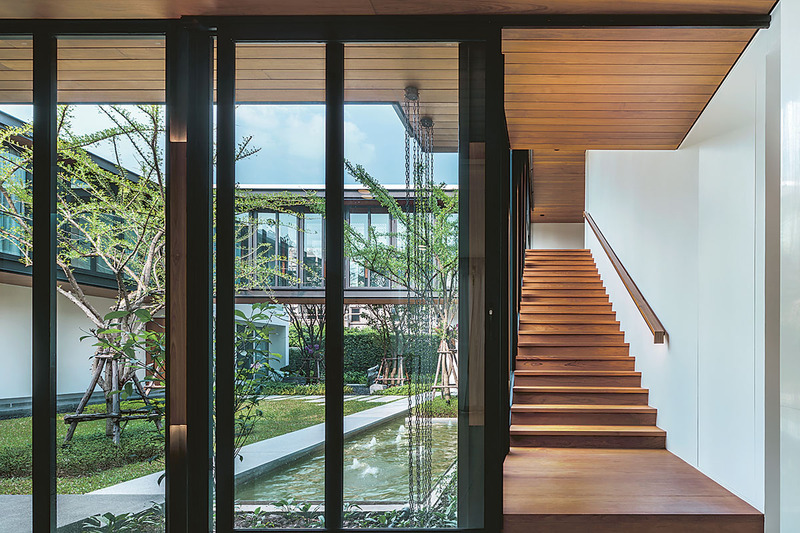 The lower floor is a multipurpose area, adapting the Thai traditional “tai thun” space below a house to fit modern lifestyles. A nearly hundred-year-old wooden house is set as the very center of the main home, and contains a shrine holding Buddha images. 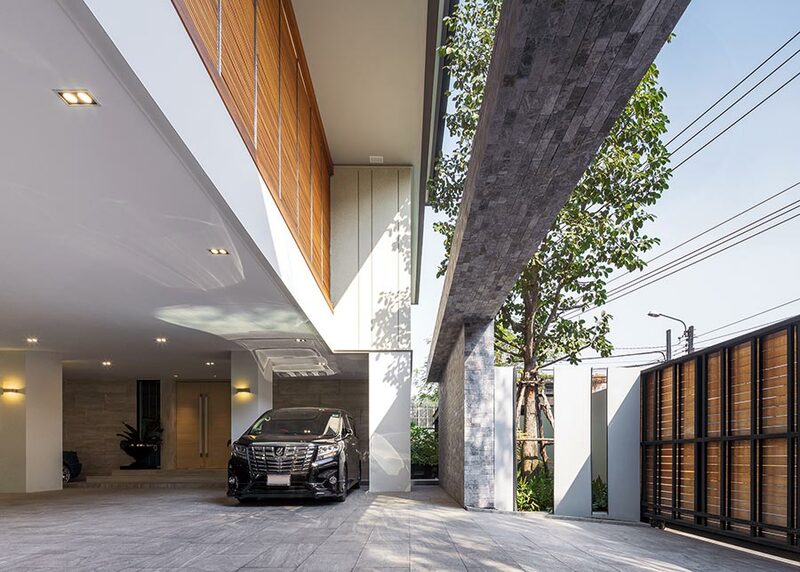 “ReGEN House,” Pankwan Hudthagosol’s home, was designed as a modern residence for a multigenerational family. 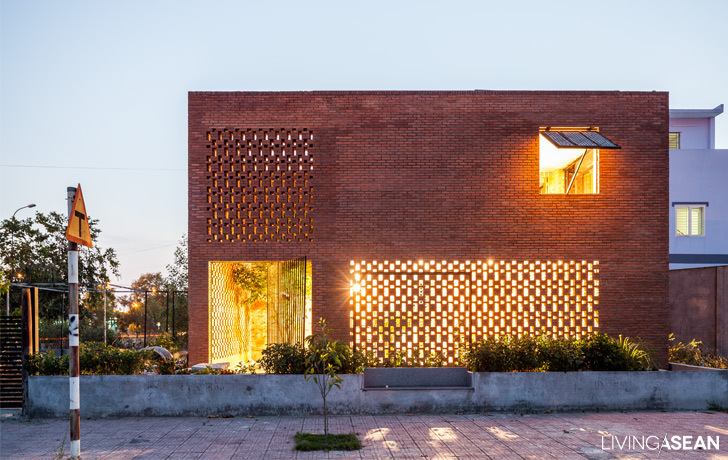 Built on the same property as his father’s house, its concept echoes his father’s belief that the gift of warmth and closeness can show us how to think and live, and both welcomes and provides a foundation in life for young Mena, the newest family member. It began with a great design from EKAR Architects. 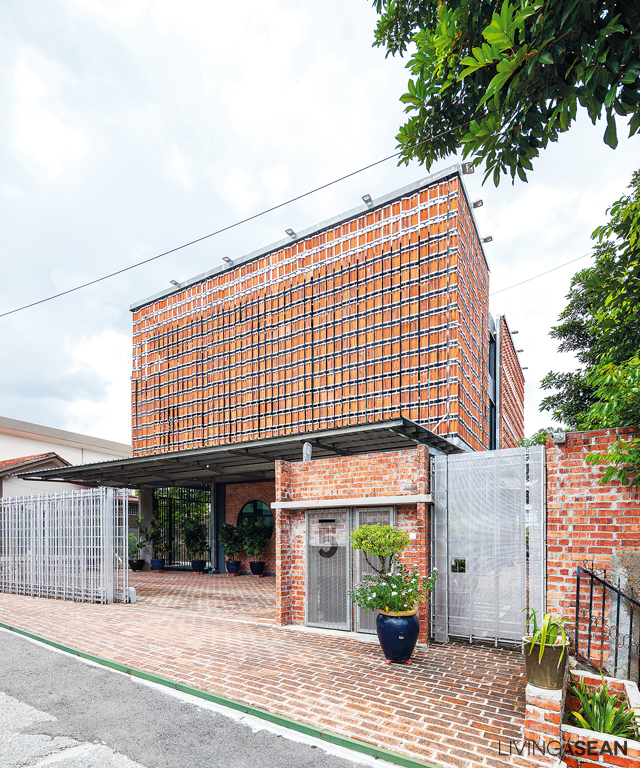 The four-storey building on about ¼ acre of land has an interior space of 1600 meters. 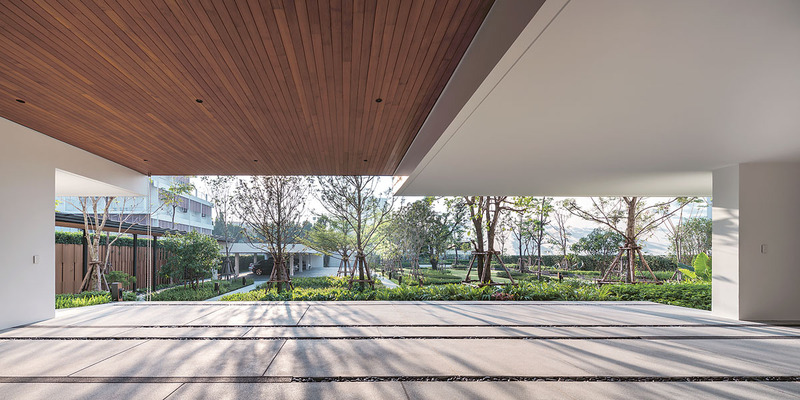 Its L-shaped layout opens on a green courtyard facing the forest-like garden at “Grandpa’s” house, connecting views for the people of three generations. The first floor holds a carport, maid’s bedroom, and rooms for swimming pool equipment and other services. 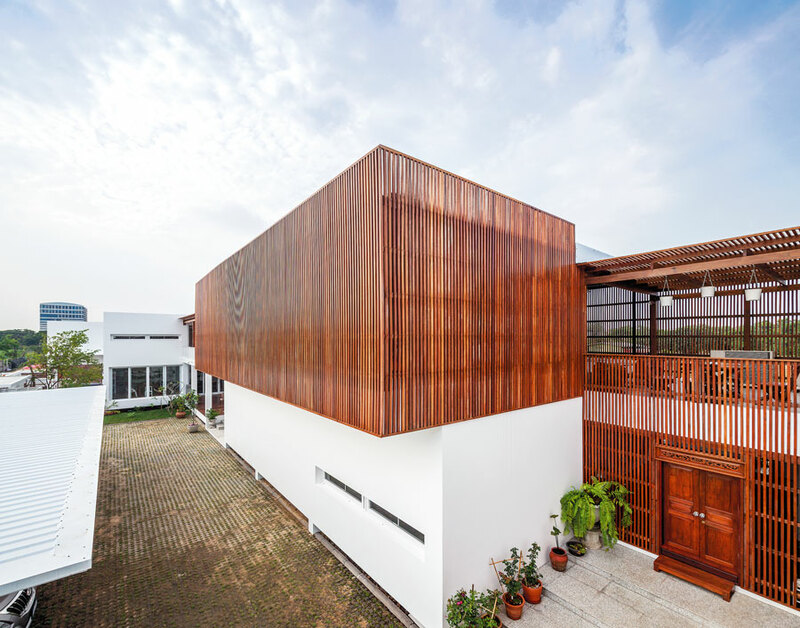 The heart of the house is the second storey, where a wide balcony/deck taking up a full half of the floor space is used for family recreational activities. This floor is designed to give the sense of being at ground level, as it reaches out to a “green roof” planted with ground cover seemingly floating atop a gazebo rising from the garden below, and with a swimming pool right there giving the feeling of an old-time streamside home.